Prime Minister Narendra Modi interacts with the ASHA, Anganwadi and ANM workers from all over the country through video conference, in New Delhi. 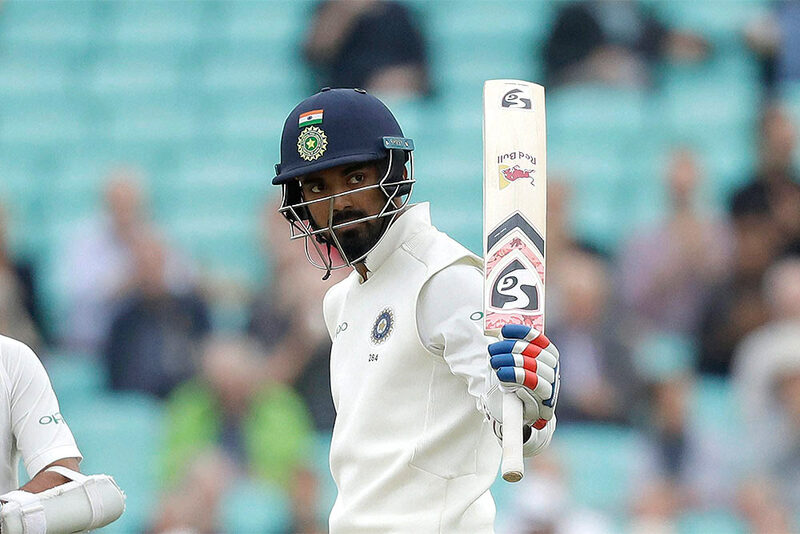 India's K. L. Rahul celebrates reaching 50 runs during the fifth cricket test match of a five match series between England and India at the Oval cricket ground in London. 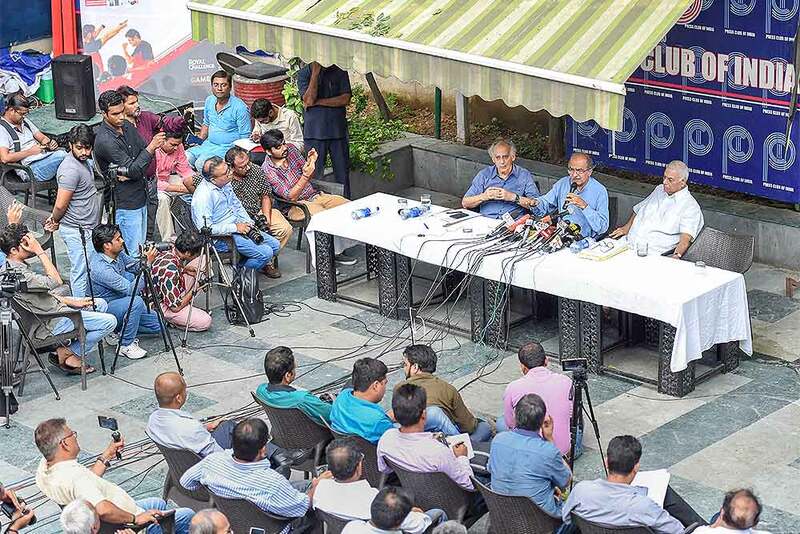 Emergency Response Officers (ERO) of the GVK Emergency Management and Research Institute (EMRI) 108 and 102 ambulance services stage a protest against their alleged exploitation by the GVKEMRI authorities, at Lokhara, Guwahati. 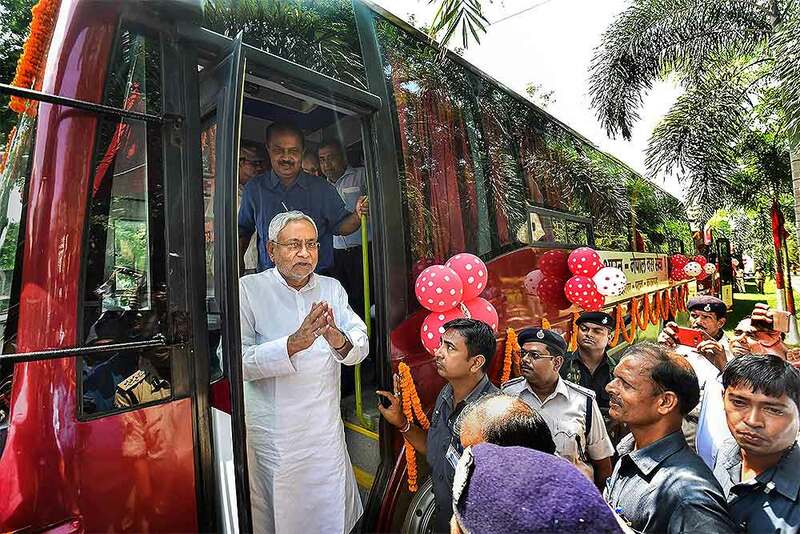 Rescue officials at the accident site where a state-owned Road Transport Corporation bus skidded into a deep gorge, at Jagtial district. 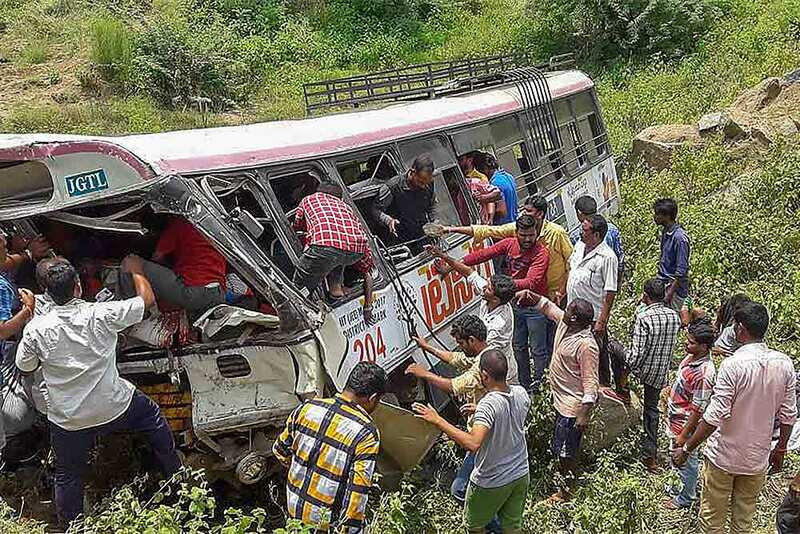 The bus returning from Kondagattu to Jagital skidded off the ghat road near Shanivarapet village and fell into the valley resulting in the accident. 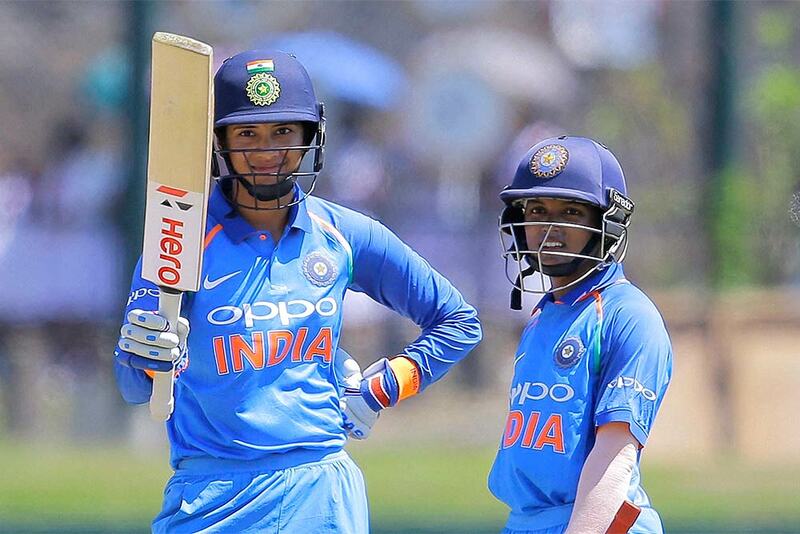 India's Smriti Mandhana, left, raises her bat scoring fifty runs against Sri Lanka as Punam Raut watches duringtheir first one day international women's cricket match in Galle, Sri Lanka. 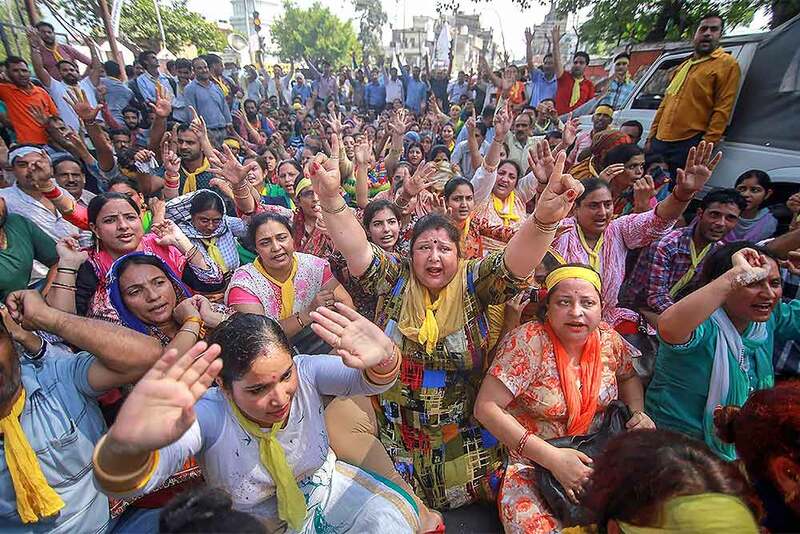 Kashmiri pandits raise slogans during a protest rally demanding for implementation of Prime Minister employement package, outside Governor House in Jammu. 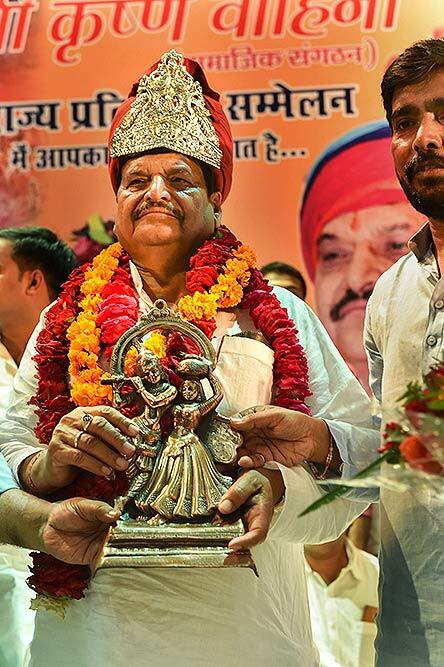 Samajwadi Secular Morcha Founder Shivpal Singh Yadav during Shri Krishna Vahini event, in Lucknow. 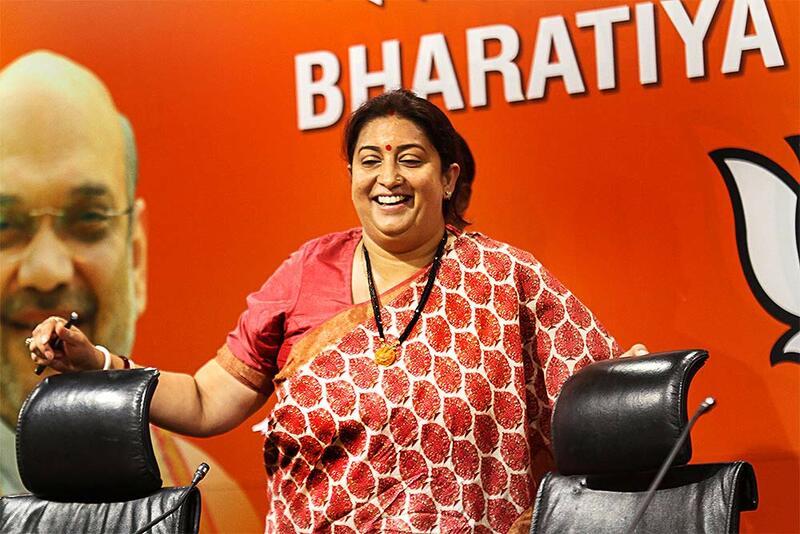 Union Textiles Minister Smriti Irani during a press conference at BJP Headquarters, in New Delhi. 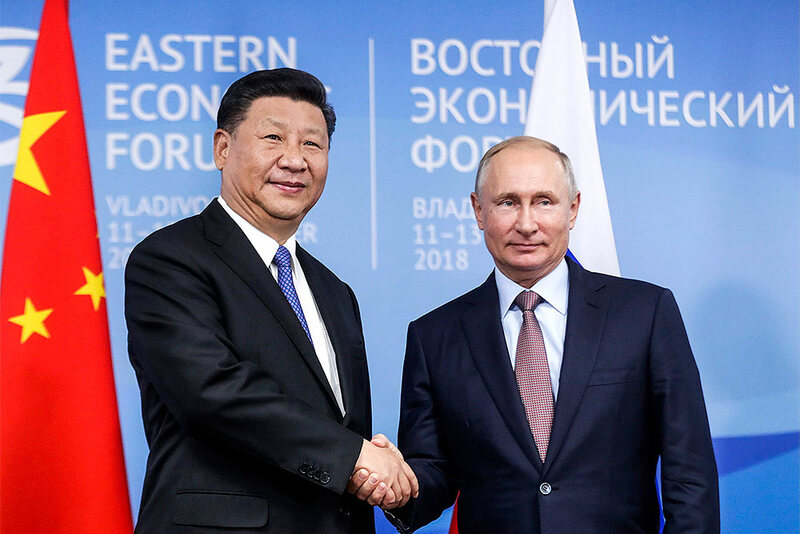 Russian President Vladimir Putin, right, shakes hands with Chinese President Xi Jinping during their meeting at the Eastern Economic Forum in Vladivostok, Russia. 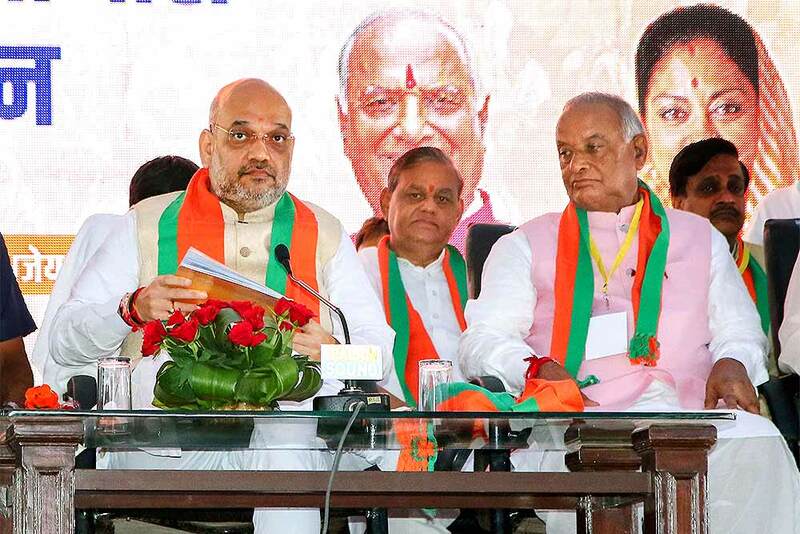 Bharatiya Janata Party President Amit Shah with party's Rajasthan President Madan Lal Saini at the party's 'Shakti Kendra Sammelan', in Jaipur. 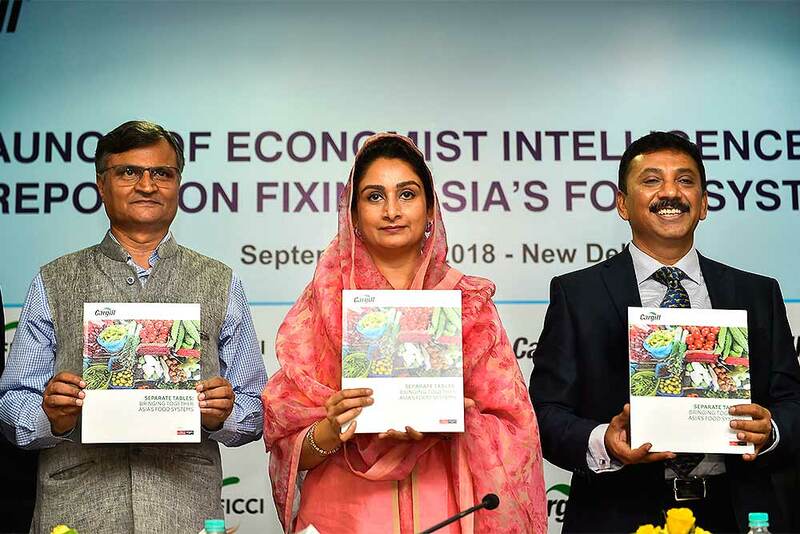 Union Minister for Food Processing Industries Harsimrat Kaur Badal (C) with Niti Aayog member Ramesh Chand (L) and Cargill India Chairman Siraj Chaudhry launches a report of the Economic Intelligence Unit on fixing Asia's food system, in New Delhi. 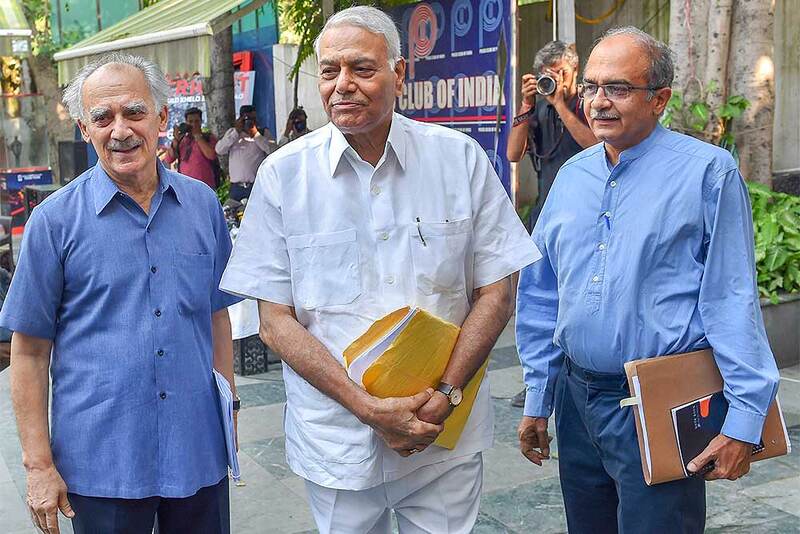 Vice Chancellor of Presidency University Anuradha Lohia (L) confers Doctor of Science (honoris causa) on Bharat Ratna legendary scientist CNR Rao during the 6th annual convocation of the University, in Kolkata. 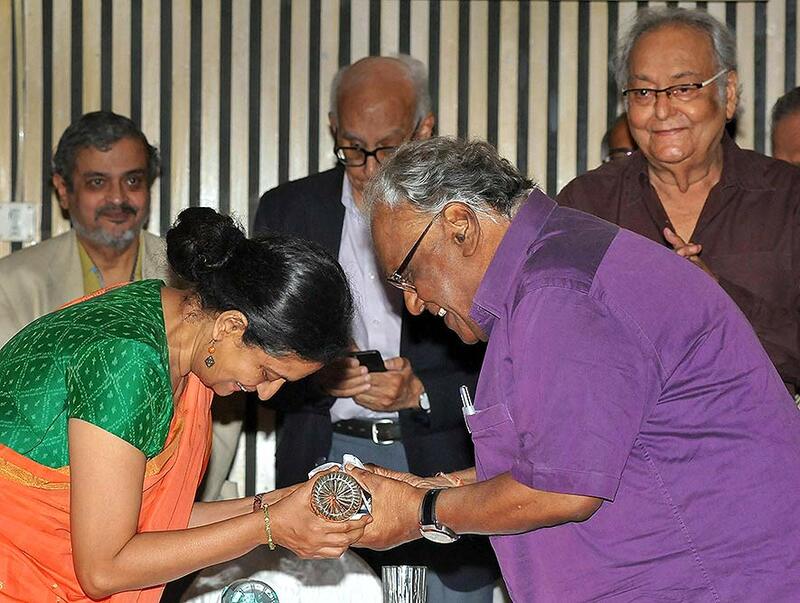 Dadasaheb Phalke awardee legendary actor Soumitra Chatterjee (R) looks on. 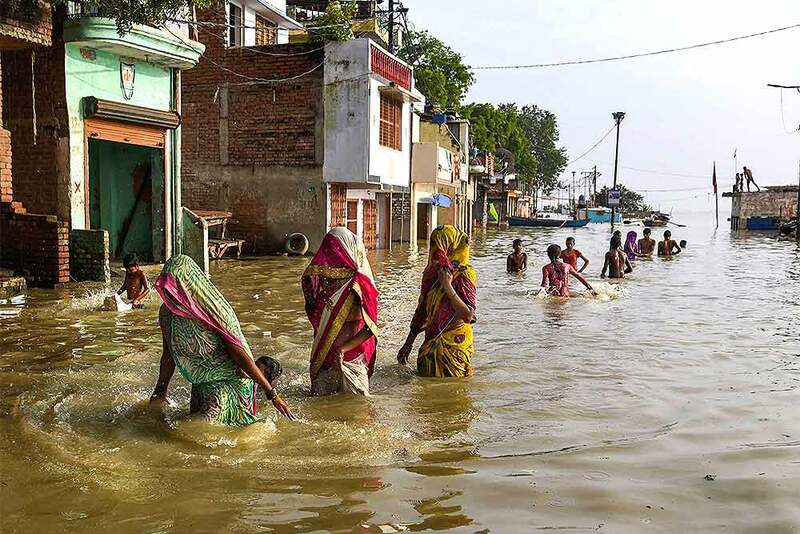 People move to safer places after water level of river Ganga rose creating a flood-like situation at Daraganj, in Allahabad. 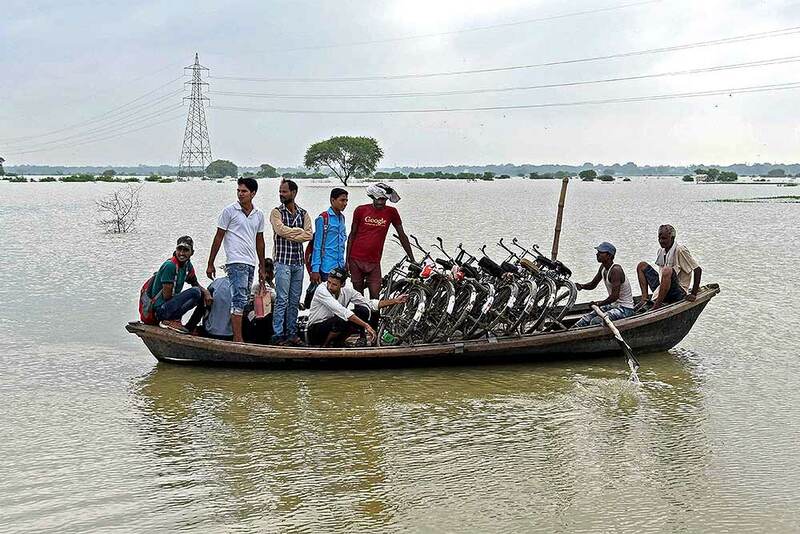 Villagers use a boat to cross flood affected area after water level of river Ganga rose creating a flood-like situation at Badra-Sonauti village, in Allahabad. 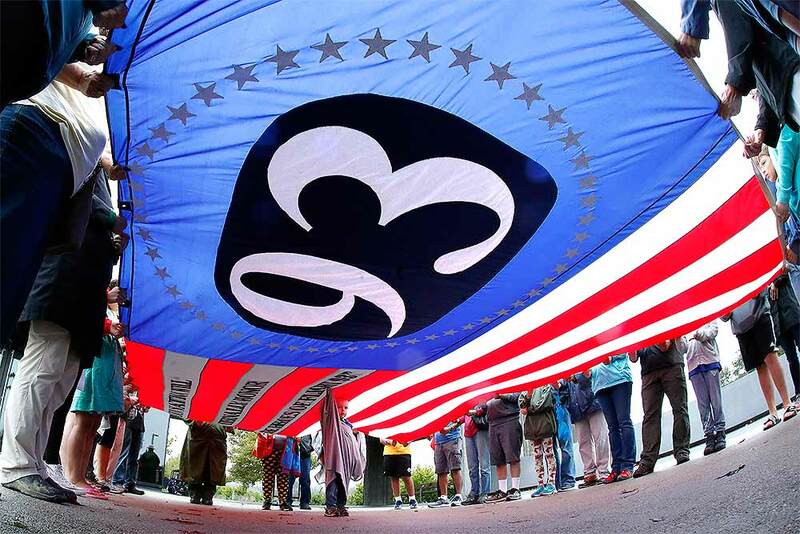 In this aerial photo, provided by Lou Dematteis Spectral Q, over twenty indigenous leaders from around the world along with supporters gather to create a "Solar Hummingbird" human installation, inspired by Colombian artist Jhon? ?Corte?s, at? 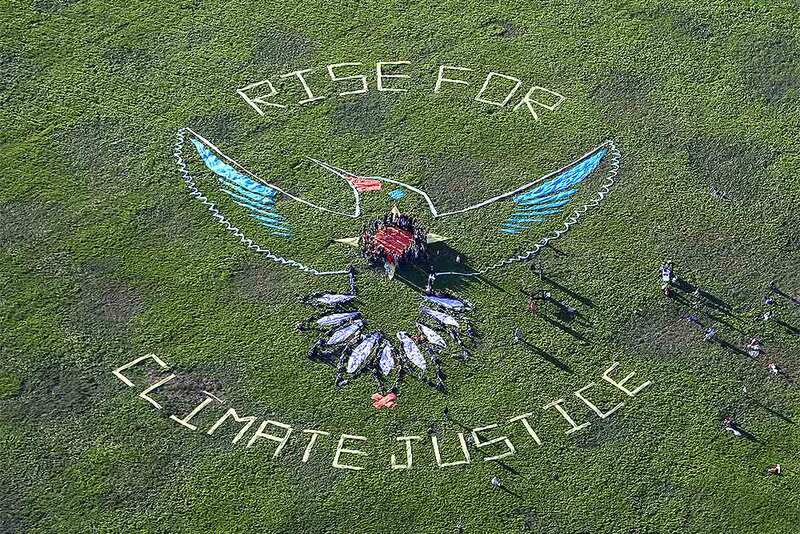 ?Crissy Field near San Francisco's Golden Gate Bridge to produce a visual message calling for climate justice and indigenous rights. 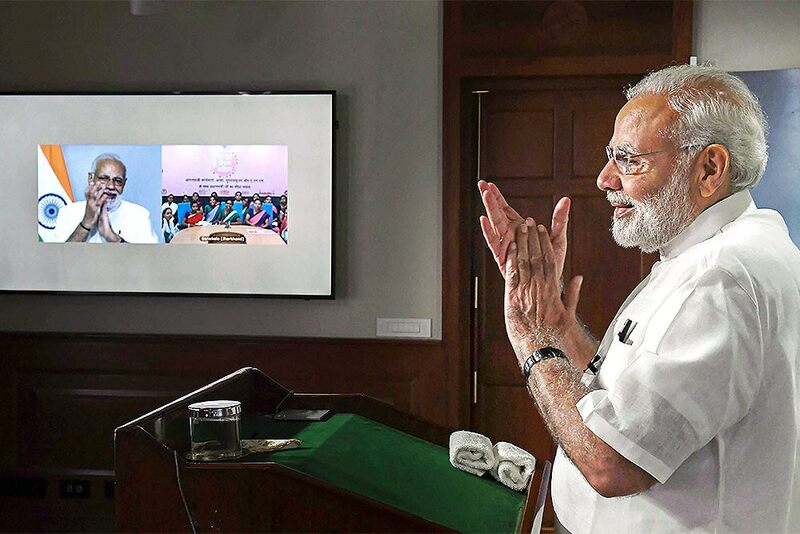 San Francisco is hosting the Global Climate Action Summit from Sept. 12 to Sept. 14, which will focus on crafting solutions to the global climate crisis. 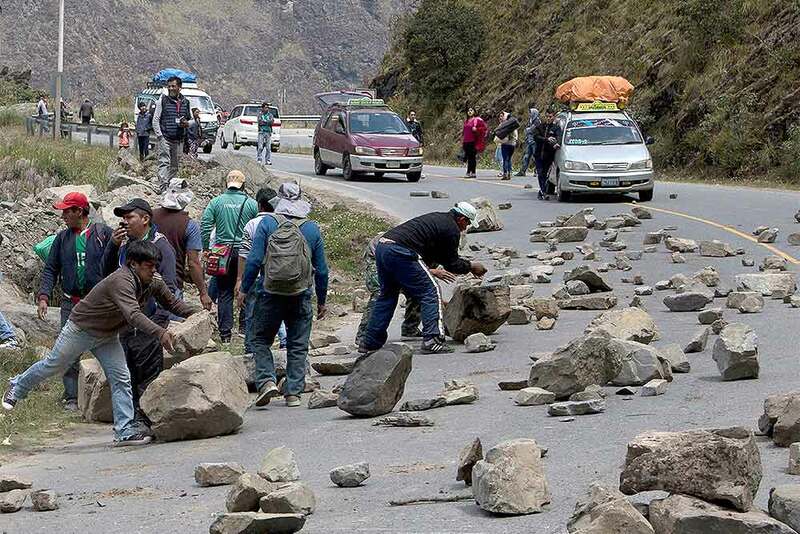 Coca farmers roll boulders on the highway, blocking traffic between the city La Paz to Los Yungas, to protest the government's coca eradication program in Unduavi, Bolivia. The protest comes after two coca growers died in clashes with anti-drug special forces police two weeks ago. 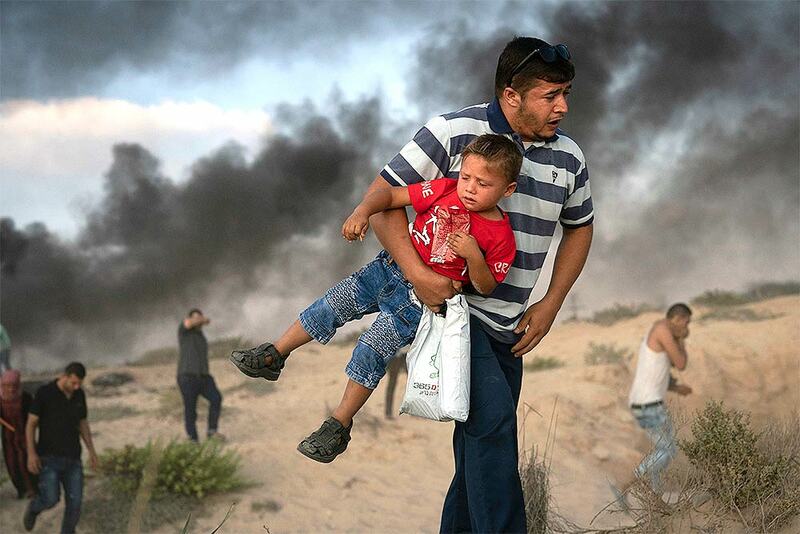 A Palestinian protester carries a boy as he runs from tear gas fired by Israeli soldiers during a protest on the beach near the border with Israel in Beit Lahiya, northern Gaza Strip. 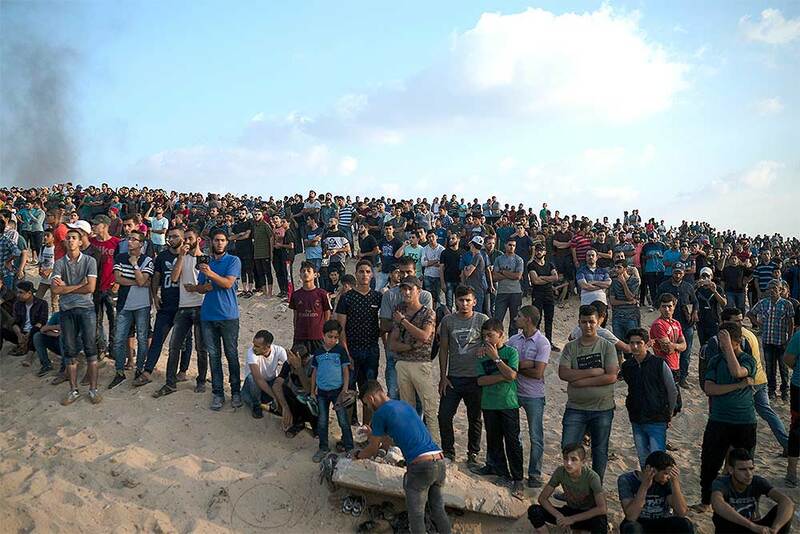 Gaza's Health Ministry says Israeli troops wounded 10 Palestinians during a protest on the enclave's northern ground and maritime fence with Israel. Palestinian gather during a protest on the beach near the border with Israel in Beit Lahiya, northern Gaza Strip. Thousands of Palestinians gathered on the beach in a Hamas-led protest to demand end of an 11-year Israeli-Egyptian blockade. 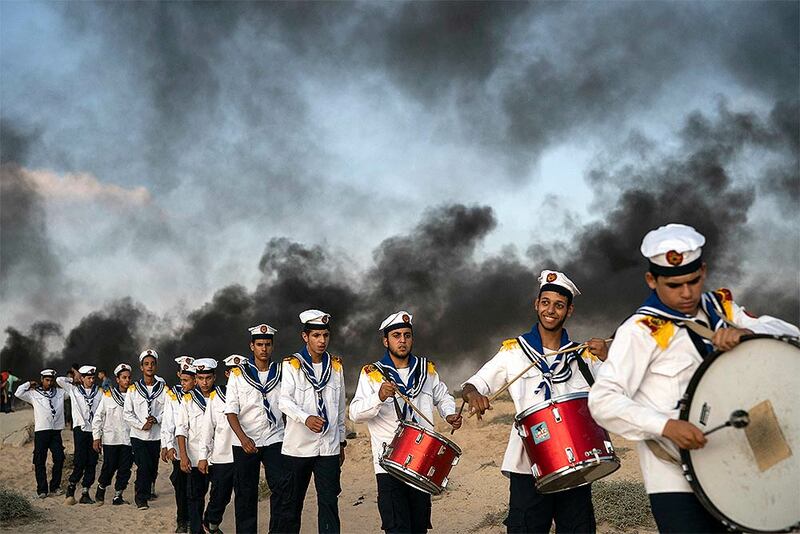 Palestinian boy scouts march during a protest on the beach near the border with Israel in Beit Lahiya, northern Gaza Strip. 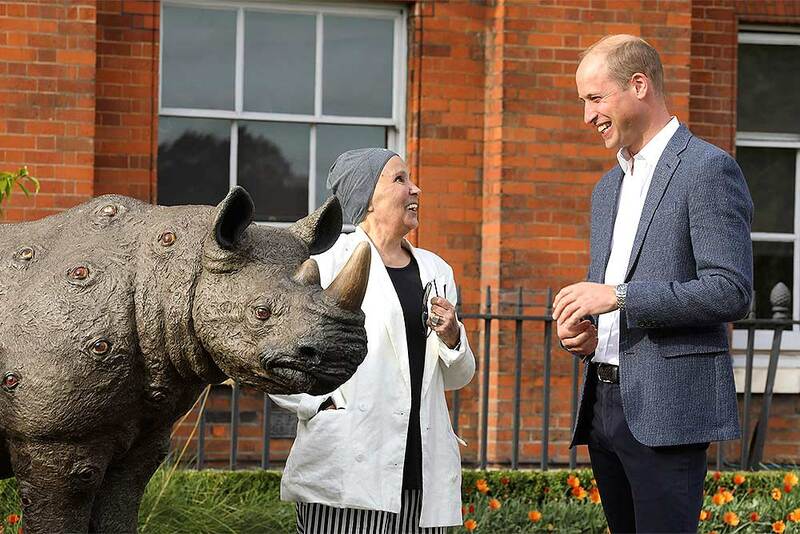 Britain's Prince William speaks with artist Nancy Fouts as he attends an event to celebrate the Tusk Rhino Trail, a London-wide art installation that celebrates the rhino and draws attention to the global poaching crisis, at Kensington Palace Gardens in London. 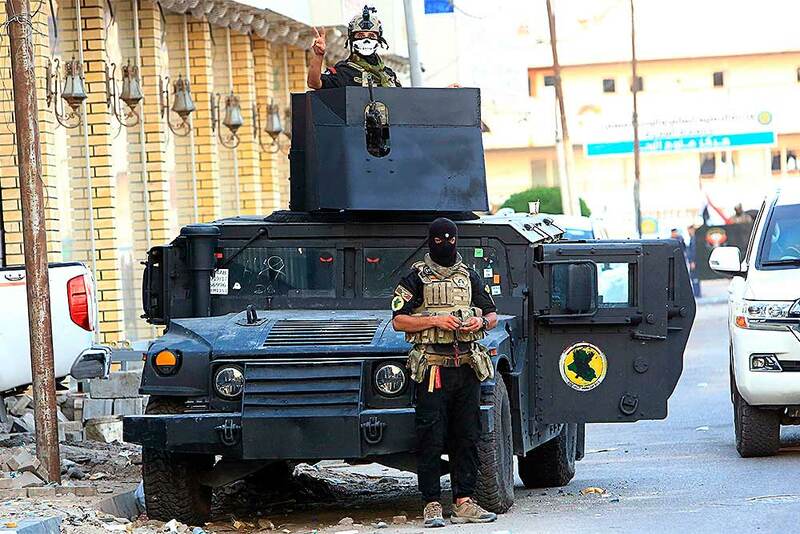 Security forces are seen in Basra, Iraq, 340 miles (550 kilometers) southeast of Baghdad. During a week of demonstrations, protesters set fire to government buildings and offices of Iranian-backed militias that they blame for mismanagement and profiteering while residents struggle with poverty. At least 15 people were killed and 249 injured in clashes between protesters and security forces in Basra so far this week, health officials say. 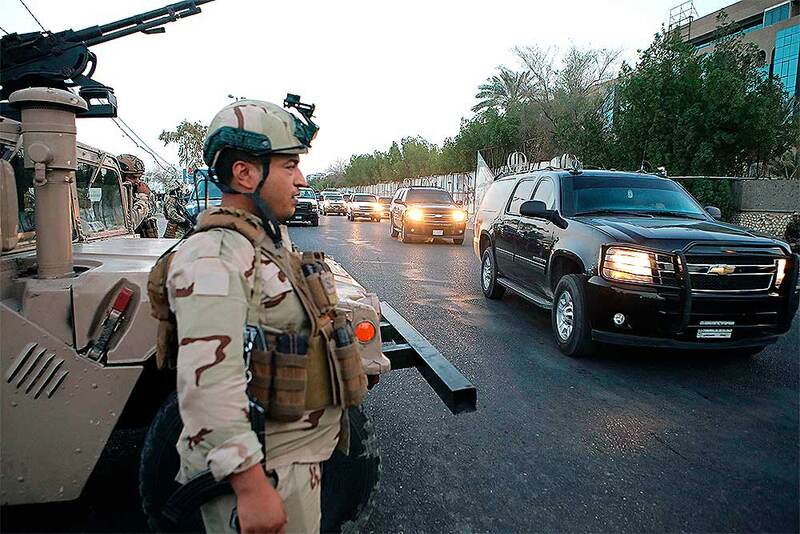 Security forces are seen in Basra, Iraq, 340 miles (550 kilometers) southeast of Baghdad. During a week of demonstrations, protesters set fire to government buildings and offices of Iranian-backed militias that they blame for mismanagement and profiteering while residents struggle with poverty. 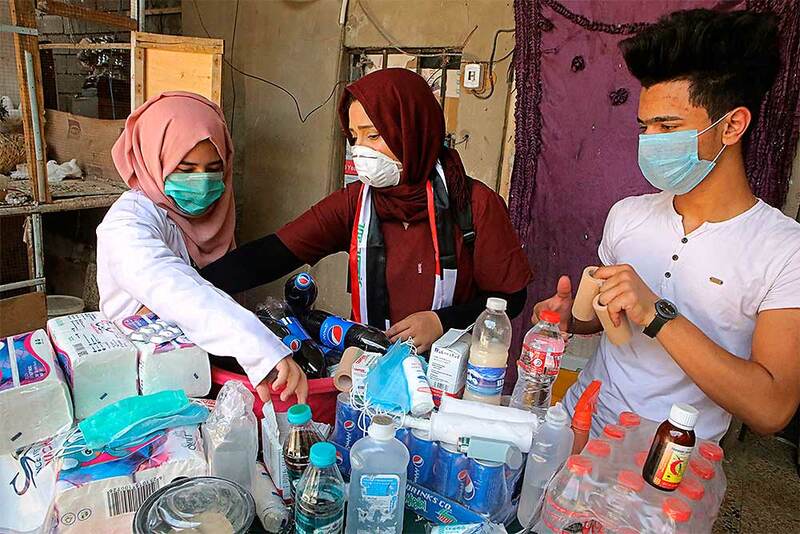 Duhaa Mayaa, center, and her two children, prepare first aid material for injured protesters, in their home in Basra, Iraq. 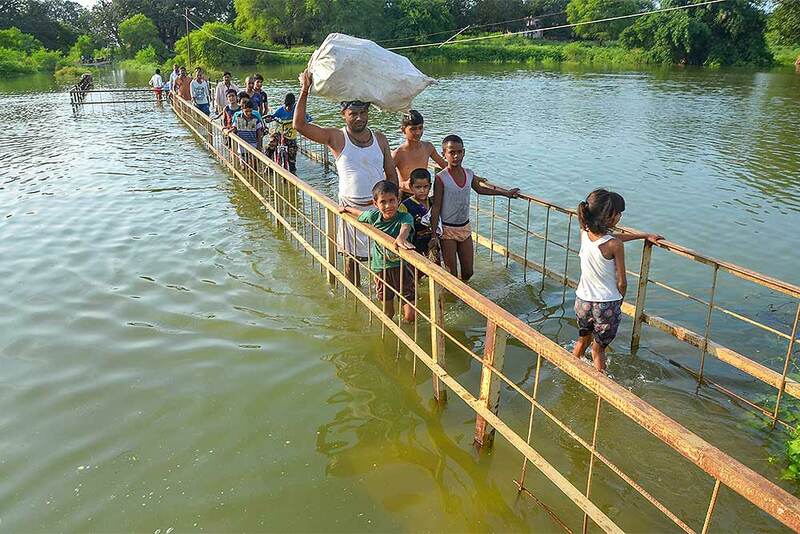 With brackish water pouring from the taps, failing city services and soaring unemployment, the southern Iraqi city of Basra has seen weeks of violent protests in the streets of the country's oil-exporting capital. 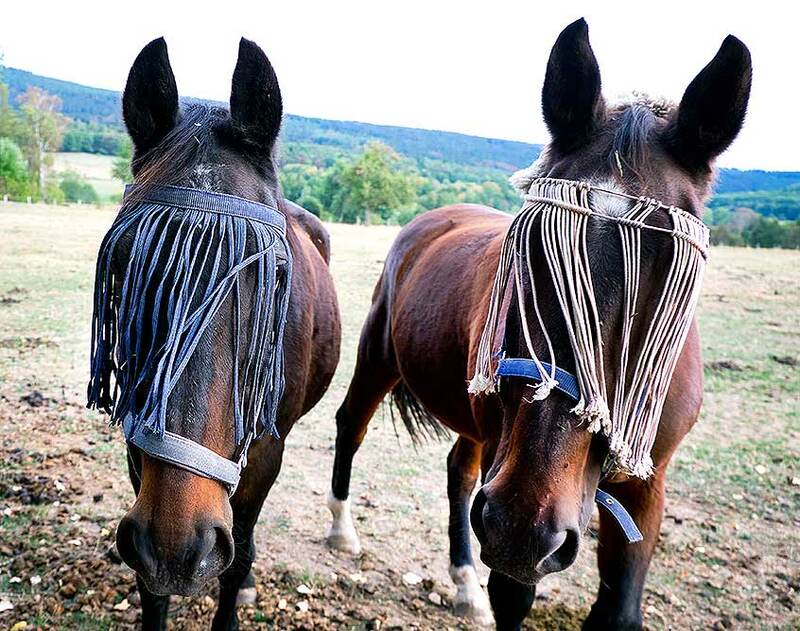 Two horses wear protection against flies and sunlight in their paddock in Neu Anspach near Frankfurt, Germany. 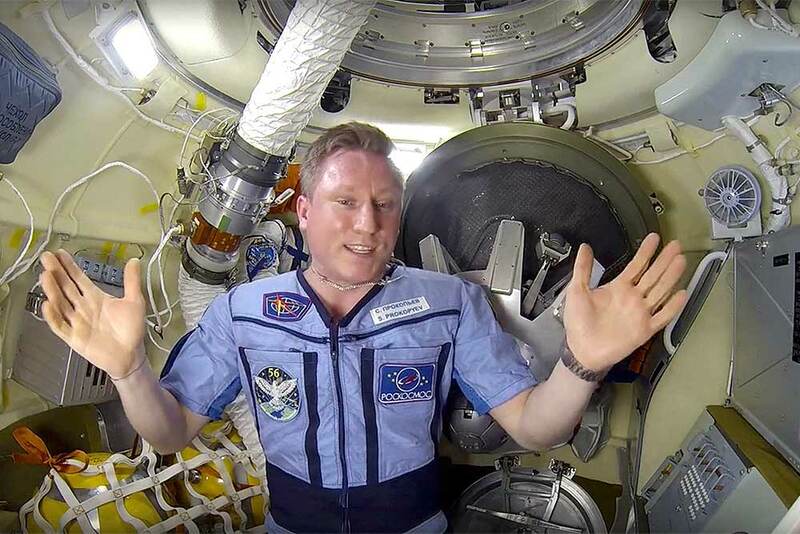 In this video grab provided by Roscosmos Space Agency Press Service, Sergei Prokopyev, a Russian cosmonaut on the International Space Station, speaks in a video message from the orbiting outpost released by the Russian space agency Roscosmos. Prokopyev explained how the crew last week located and sealed a tiny hole that created a slight loss of pressure. 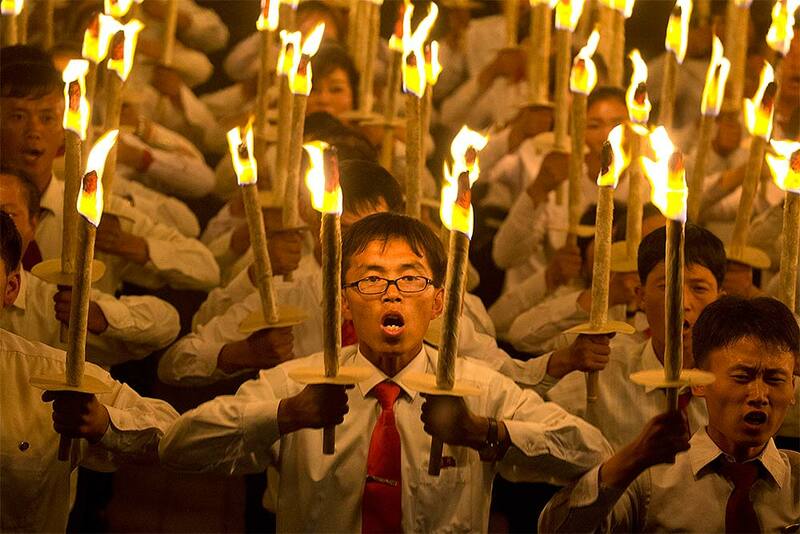 North Korean students take part in a torch light march held in conjunction with the 70th anniversary of North Korea's founding day celebrations in Pyongyang, North Korea. 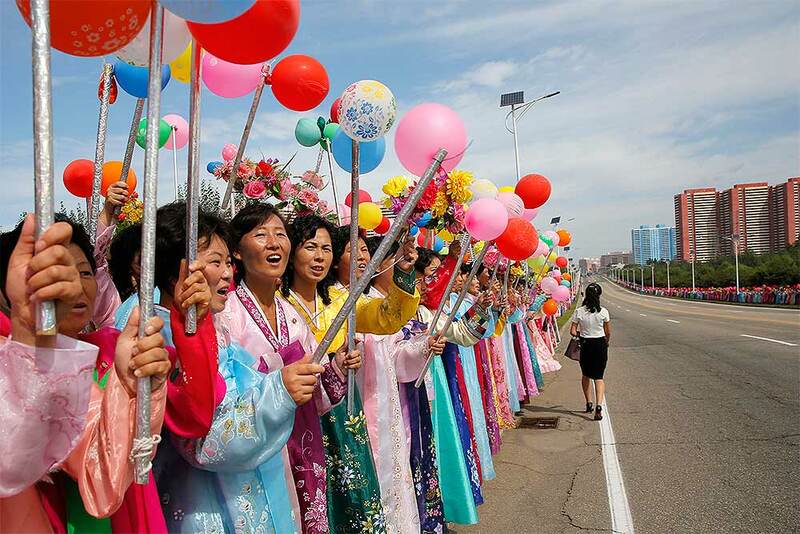 North Koreans cheer for a peace parade held by foreign delegates invited to the celebration of North Korea's 70 anniversary in Pyongyang, North Korea. 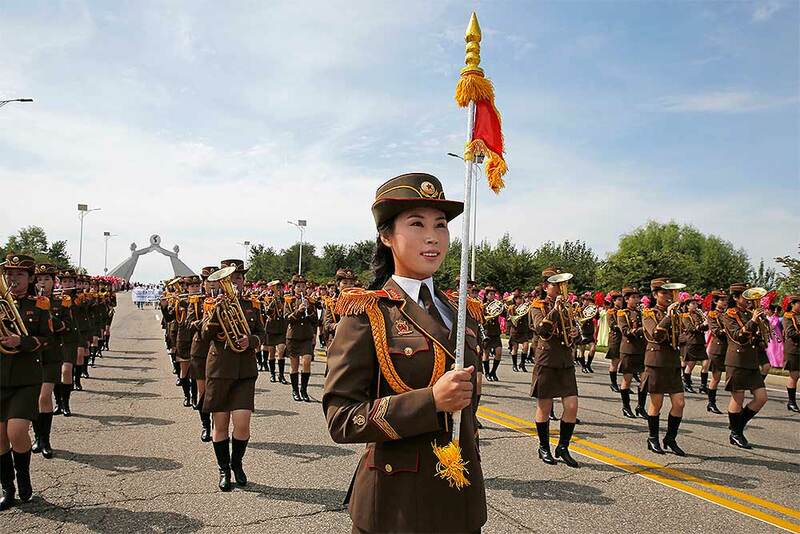 North Korean military band members march during a peace parade held by foreign delegates invited to the celebration of North Korea's 70 anniversary in Pyongyang, North Korea. 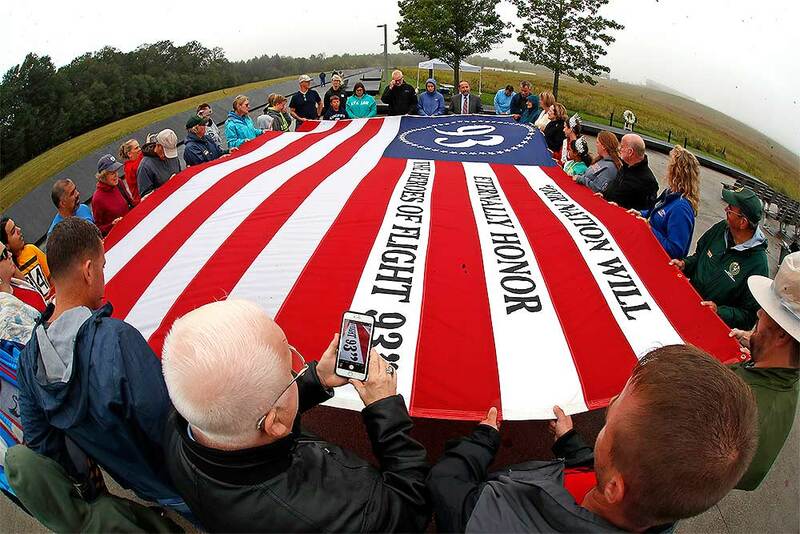 Visitors to the Flight 93 National Memorial in Shanksville, Pa., hold a giant Flight 93 flag during a moment of remembrance as the nation marks the 17th anniversary of the Sept. 11, 2001, attacks. 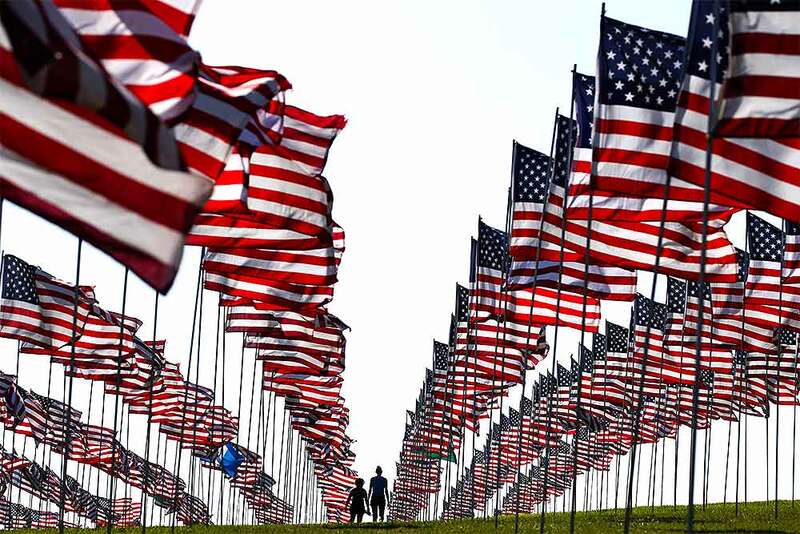 Bianca Burton, center left, and Erin Schultheis walk around the Pepperdine University's annual display of flags honoring the victims of the 9/11 terrorist attacks, in Malibu, California. 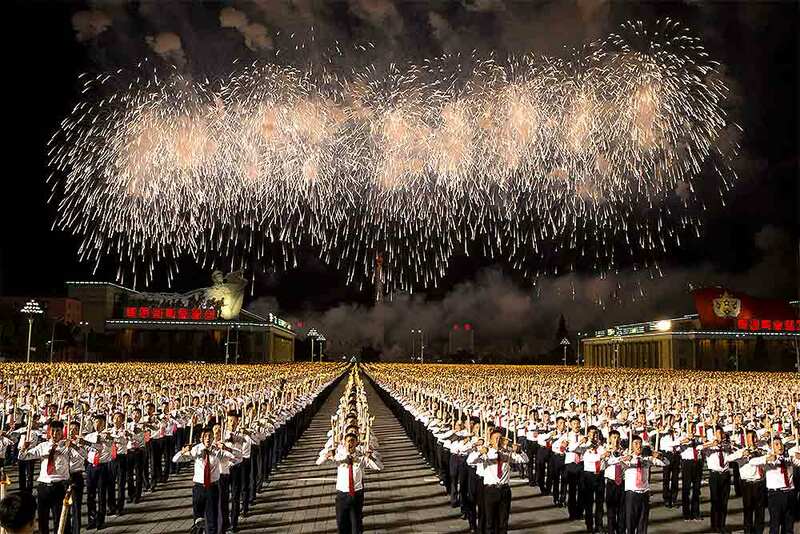 Terrorists used hijacked planes to crash Sept. 11, 2001, into the World Trade Centers, the Pentagon and a field in Pennsylvania. 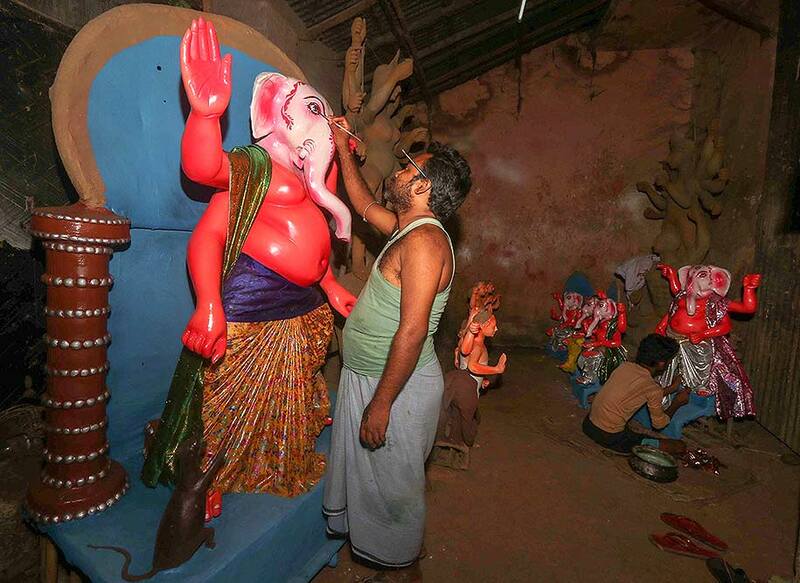 Nearly 3,000 people were killed in the attacks. Portugal's Pepe, right and Ruben Dias wave and clap the fans after beating Italy 1-0 during the UEFA Nations League soccer match between Portugal and Italy at the Luz stadium in Lisbon. Sweden's Pontus Jansson, left, fights for the ball with Turkey's Cenk Tosun during the UEFA Nations League soccer match between Sweden and Turkey at Friends Arena in Solna, Stockholm. Former soccer great Diego Maradona sings with his team and fans in stands, during a training session on the pitch at the Dorados de Sinaloa soccer club stadium, after Maradona was presented as the new manager of the Dorados in Culiacan, Mexico. Maradona, whose public battles with cocaine made him soccer's poster child for the perils of substance abuse, is setting up camp in Mexico's drug cartel heartland as the new coach of a second-tier team. 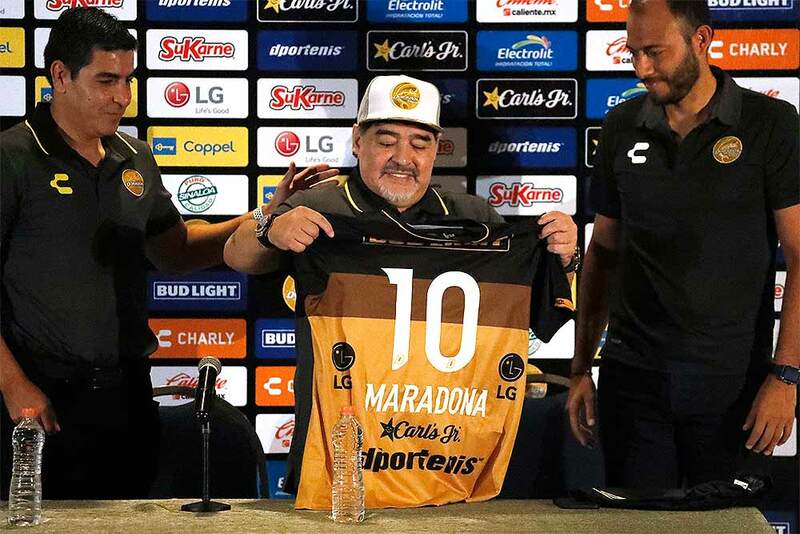 Former soccer great Diego Maradona, show his team jersey during a press conference where he was presented as the new manager of the Dorados of Sinaloa, in Culiacan, Mexico. 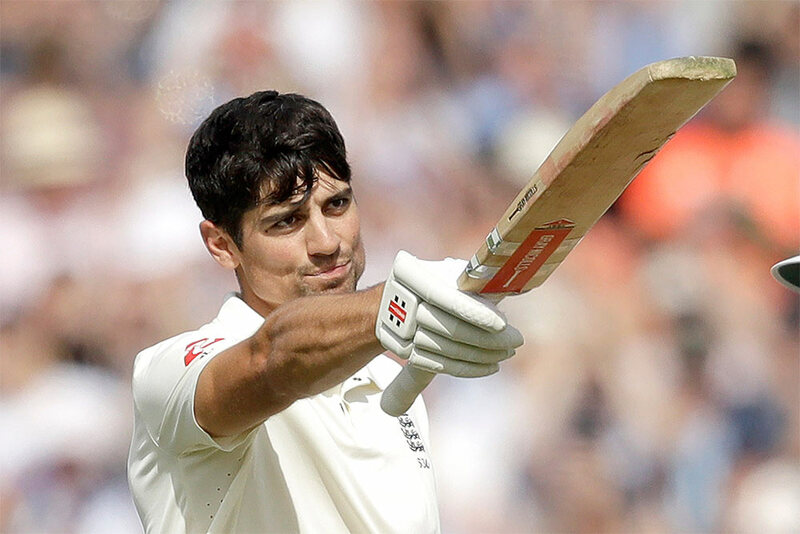 England's Alastair Cook, in his last ever batting innings before retiring from test cricket, celebrates reaching his century during the fifth cricket test match of a five match series between England and India at the Oval cricket ground in London. 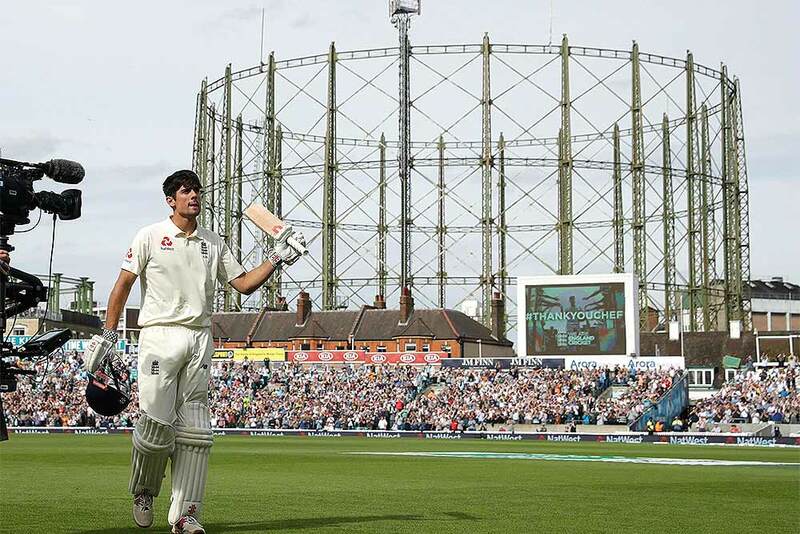 England's Alastair Cook, in his last ever batting innings before retiring from test cricket, walks off the field of play after losing his wicket from the bowling of India's Hanuma Vihari for 147 runs during the fifth cricket test match of a five match series between England and India at the Oval cricket ground in London. 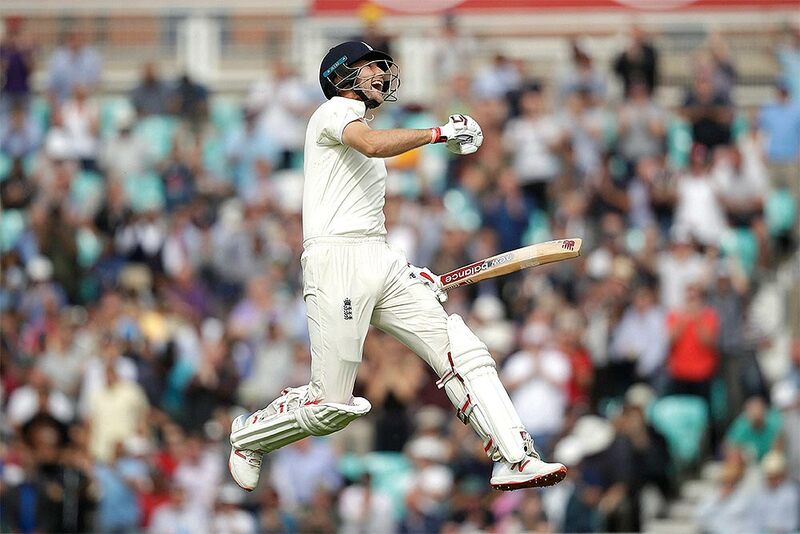 England's Joe Root celebrates his century during the fifth cricket test match of a five match series between England and India at the Oval cricket ground in London. 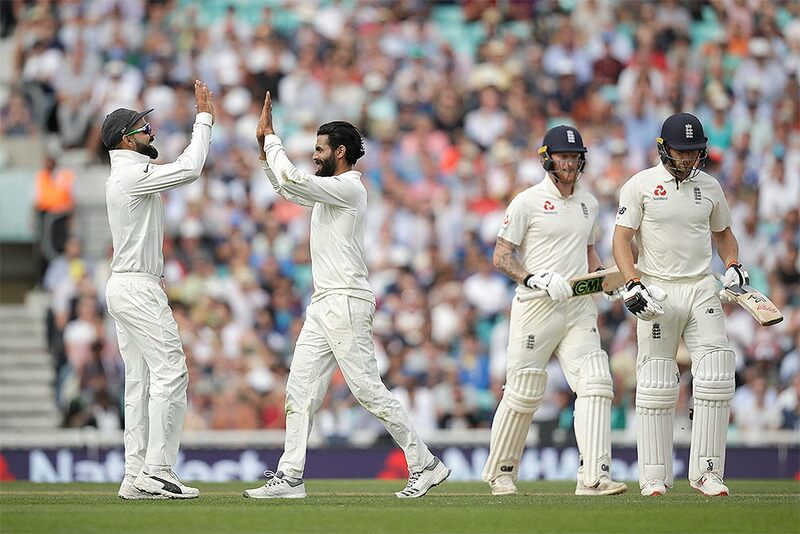 India's Ravindra Jadeja, second left, celebrates taking the wicket of England's Jos Buttler, right, with India captain Virat Kohli during the fifth cricket test match of a five match series between England and India at the Oval cricket ground in London. 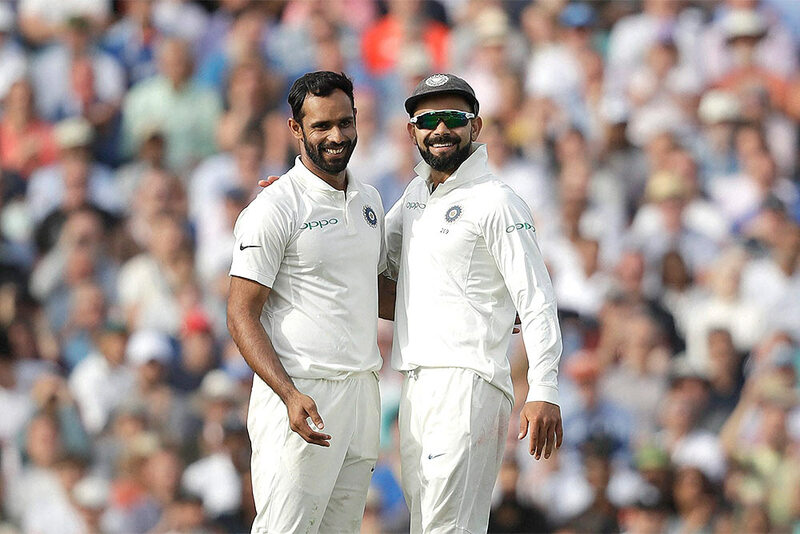 India's Hanuma Vihari, left, celebrates taking the wicket of England's Sam Curran with India captain Virat Kohli during the fifth cricket test match of a five match series between England and India at the Oval cricket ground in London. 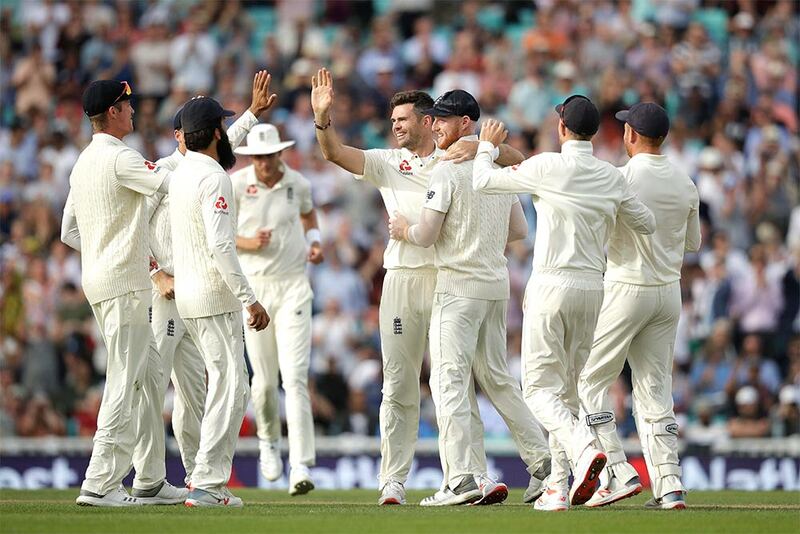 England's Jimmy Anderson, center, celebrates taking the wicket of India's Shikhar Dhawan during the fifth cricket test match of a five match series between England and India at the Oval cricket ground in London. 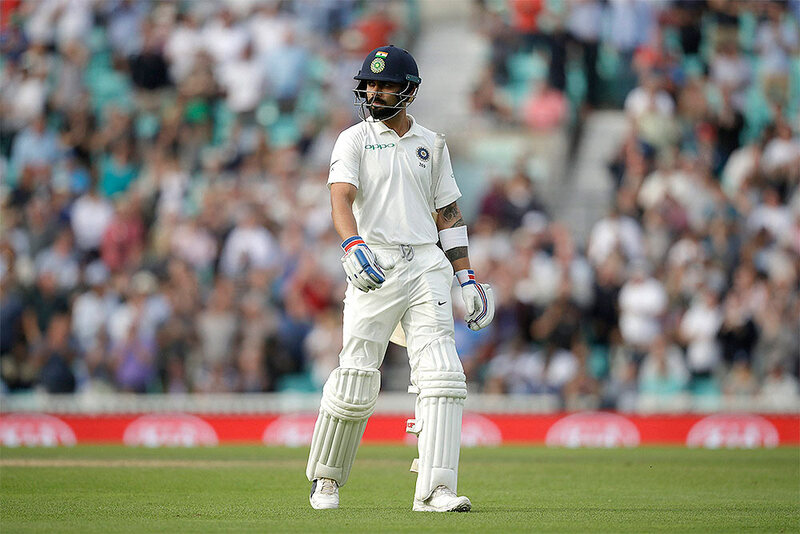 India captain Virat Kohli walks off the field of play after losing his wicket from the bowling of England's Stuart Broad during the fifth cricket test match of a five match series between England and India at the Oval cricket ground in London. 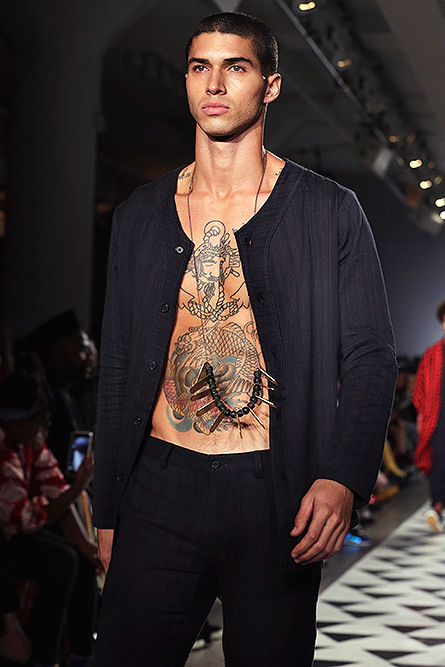 A model walks the runway at the Anna Sui spring 2019 show during New York Fashion Week. 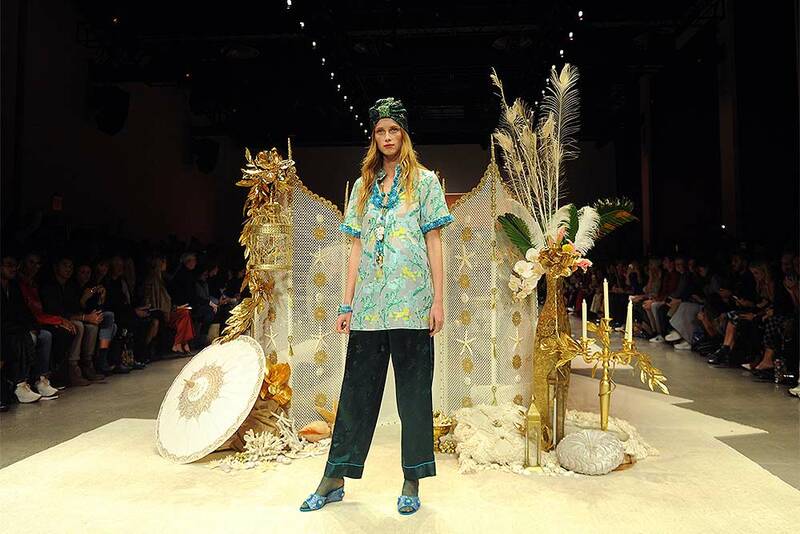 Gigi Hadid walks the runway at the Anna Sui spring 2019 show during New York Fashion Week. 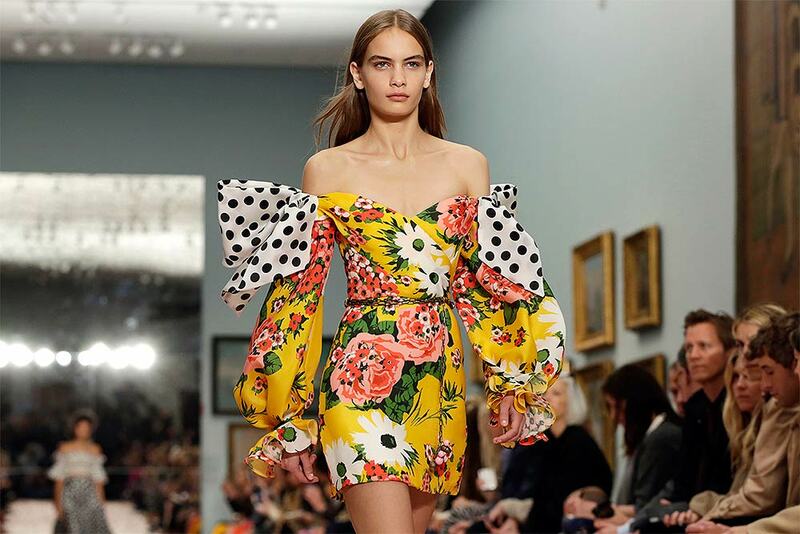 The Carolina Herrera spring 2019 collection is modeled during Fashion Week in New York. 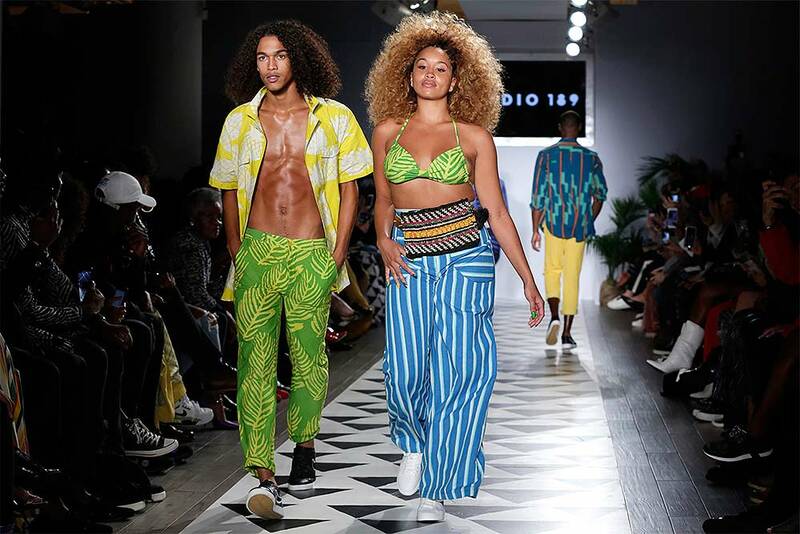 The Studio 189 spring 2019 collection is modeled during Fashion Week in New York. 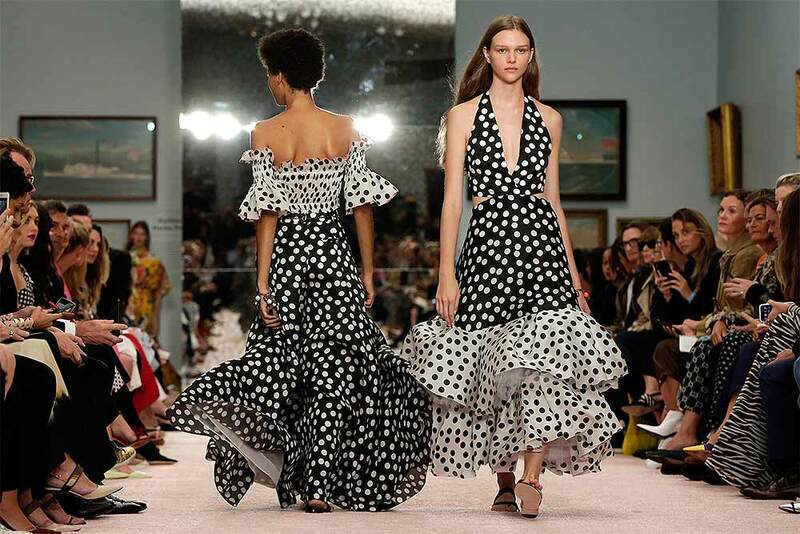 Anna Kendrick, left, and Blake Lively attend the world premiere of "A Simple Favor" at The Museum of Modern Art in New York. 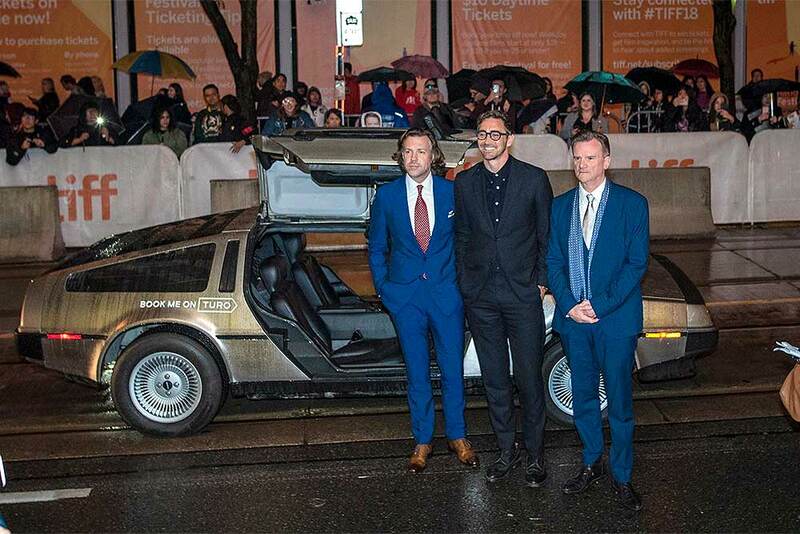 Actors Jason Sudeikis, left to right, Lee Pace and director Nick Hamm pose for photo on the red carpet for the premiere of the film "Driven" during the 2018 Toronto International Film Festival in Toronto. 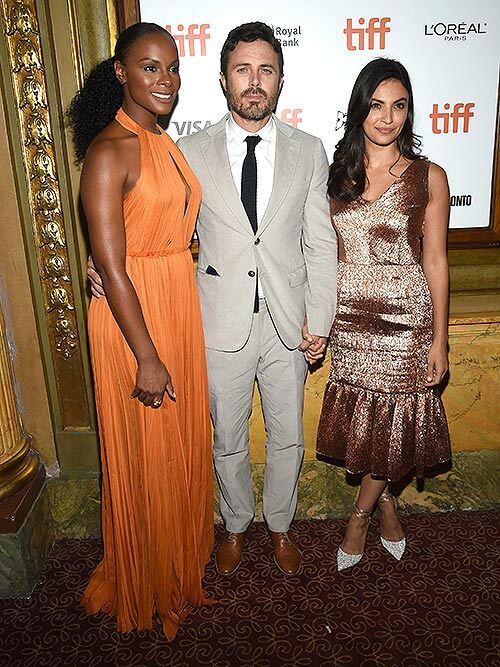 Tika Sumpter, from left, Casey Affleck and Floriana Lima attend the premiere for "The Old Man & The Gun" on day 5 of the Toronto International Film Festival at the Elgin Theatre in Toronto. 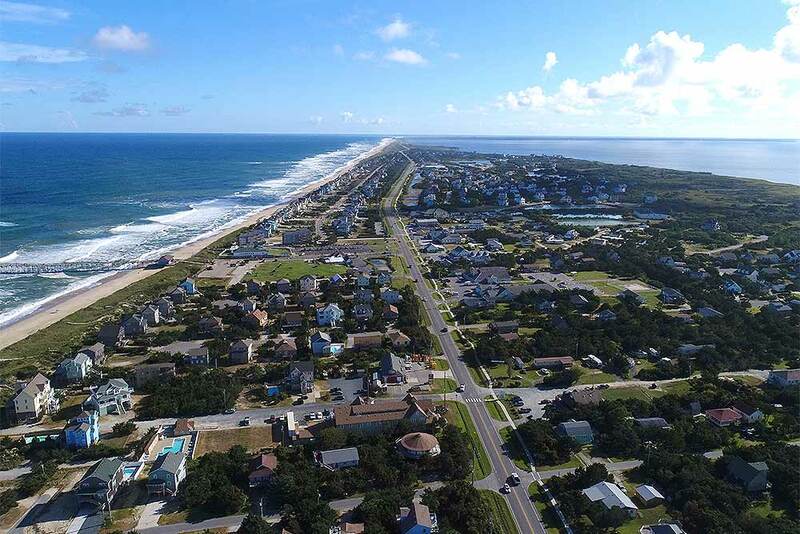 In this photo provided by DroneBase, waves crash along Avon, North Carolina, in the Outer Banks ahead of Hurricane Florence. 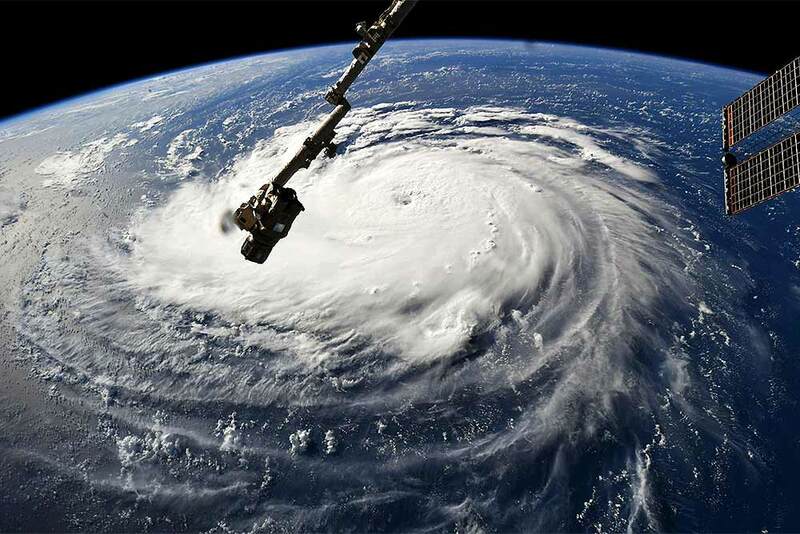 This photo provided by NASA shows Hurricane Florence from the International Space Station as it threatens the U.S. East Coast. 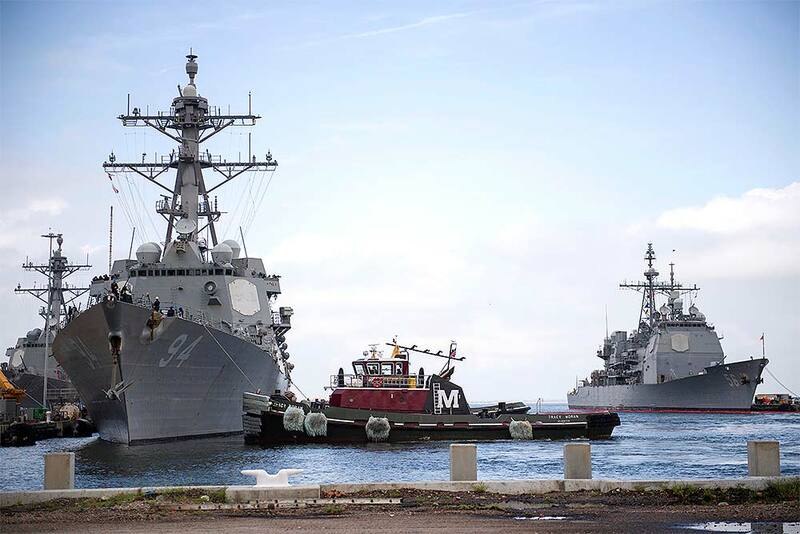 In this photo released by the U.S. Navy, the guided-missile destroyer USS Nitze departs Naval Station Norfolk after the announcement of Hurricane Florence, in Norfolk, Virginia. 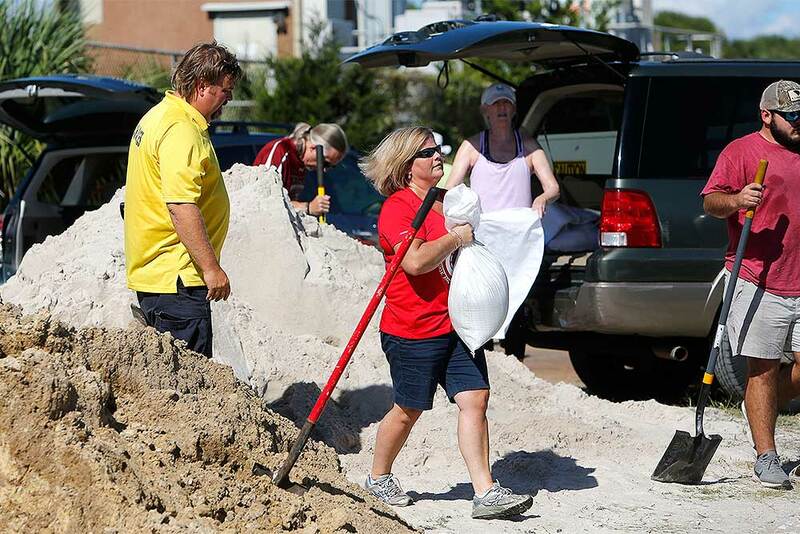 Residents of the Isle of Palms, South Carolina, fill sand bags at the Isle of Palms municipal lot where the city was giving away free sand in preparation for Hurricane Florence at the Isle of Palms South Carolina. 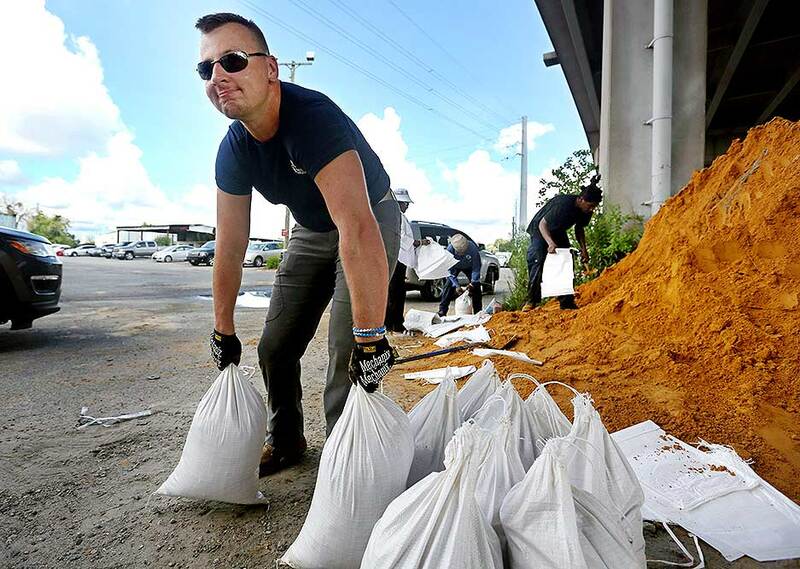 Kevin Orth loads sandbags into cars on Milford Street as he helps residents prepare for Hurricane Florence, in Charleston, South Carolina. 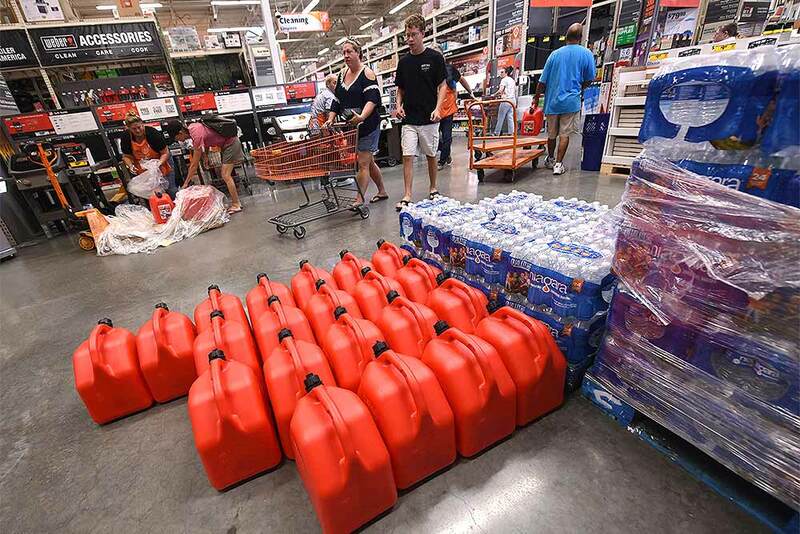 People buy supplies at The Home Depot in Wilmington, North Carolina. 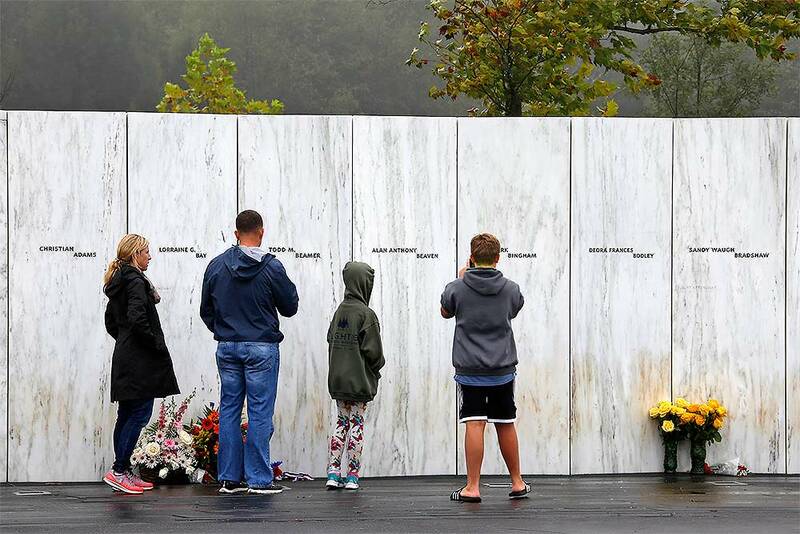 Florence rapidly strengthened into a potentially catastrophic hurricane on Monday as it closed in on North and South Carolina, carrying winds and water that could wreak havoc over a wide stretch of the eastern United States later this week. 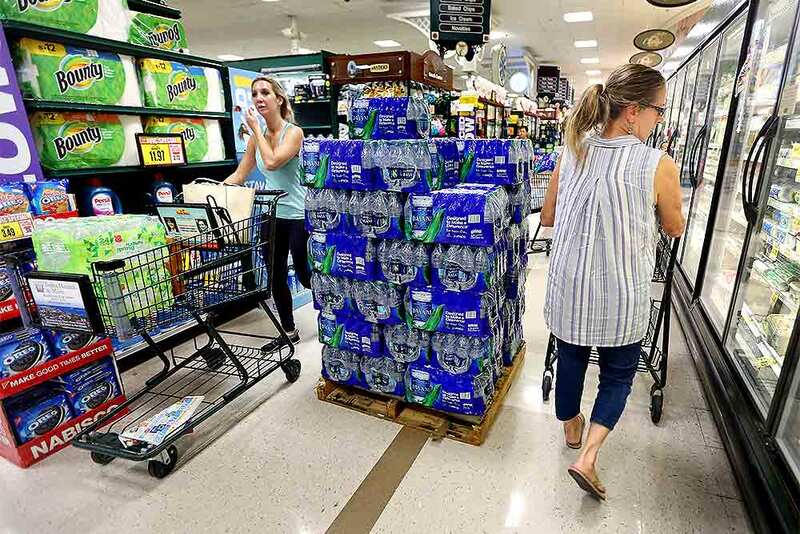 People shop at the Harris Teeter, filling up on water and supplies as Hurricane Florence becomes a threat to the coast in Charleston, South Carolina. 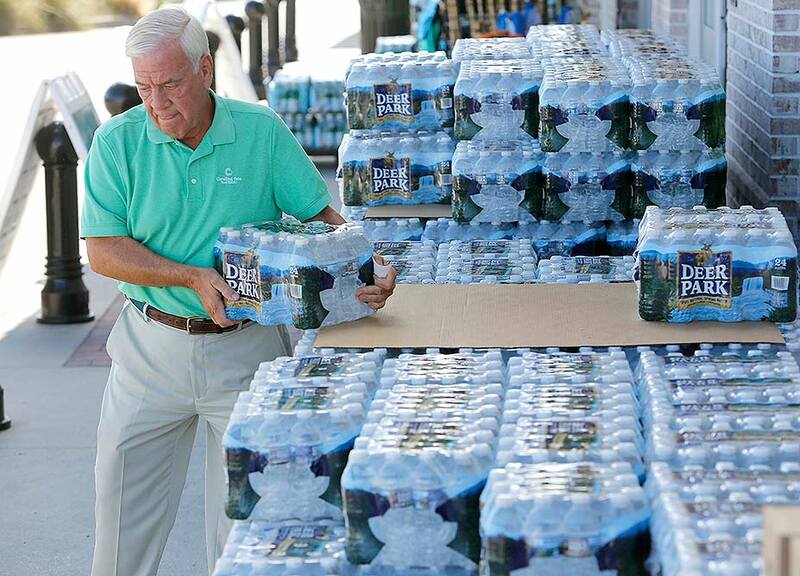 Larry Pierson, from the Isle of Palms, S.C., purchases bottled water from the Harris Teeter grocery store on the Isle of Palms in preparation for Hurricane Florence at the Isle of Palms South Carolina. 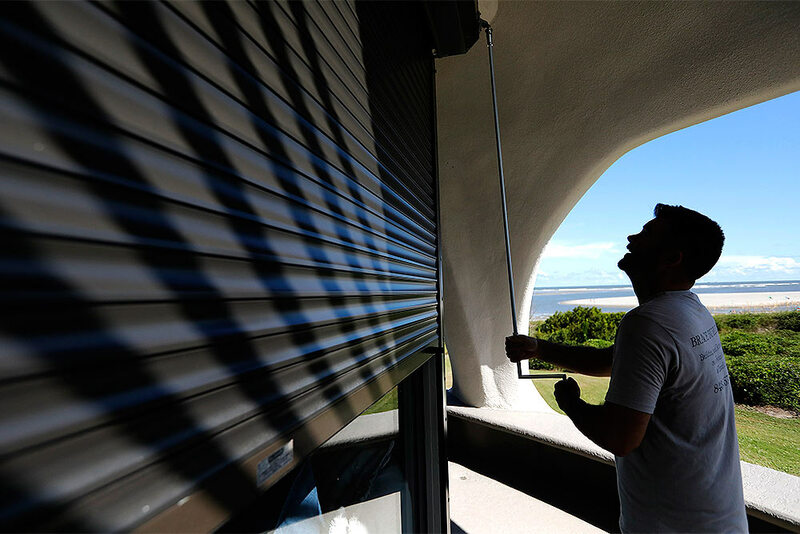 Chris Brace, from Charleston, S.C. lowers hurricane shutters on a client's house in preparation for Hurricane Florence at Sullivan's Island, South Carolina. Brace said that after S.C. Gov. Henry McMaster ordered an evacuation the property owner asked for the house to be boarded up. 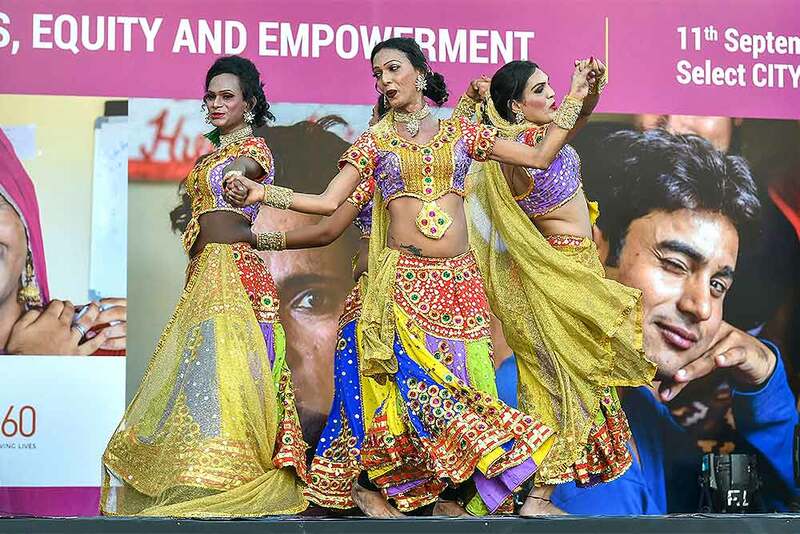 Transwomen artists perform during the inauguration of seventh edition of Hijra Habba, in New Delhi. 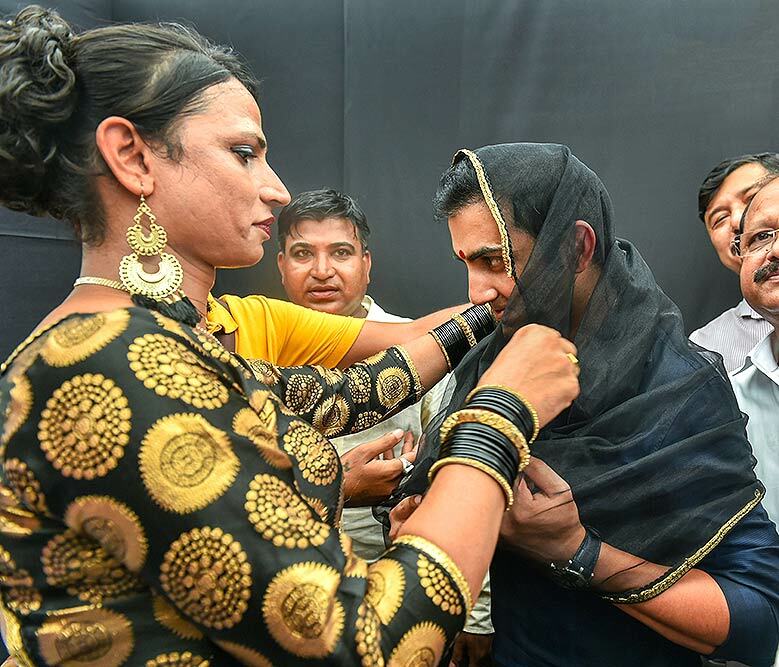 Cricketer Gautam Gambhir during the inauguration of seventh edition of Hijra Habba, in New Delhi. 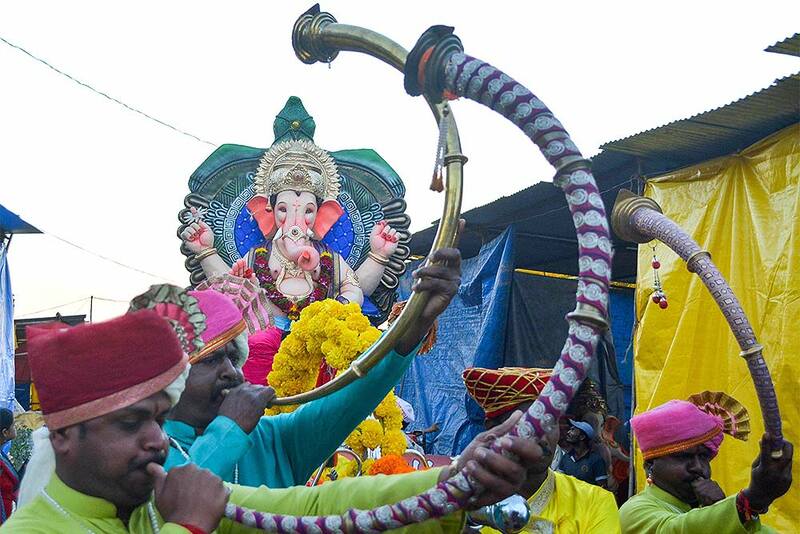 Members of the audience look on as cricketer Gautam Gambhir inaugurates the seventh edition of Hijra Habba, in New Delhi. 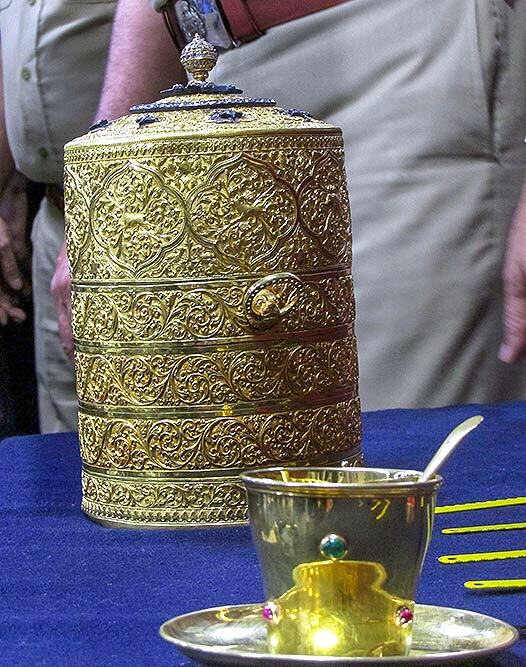 Police show to media the three-tier golden tiffin box and a golden tea-cup saucer after their recovery, in Hyderabad. 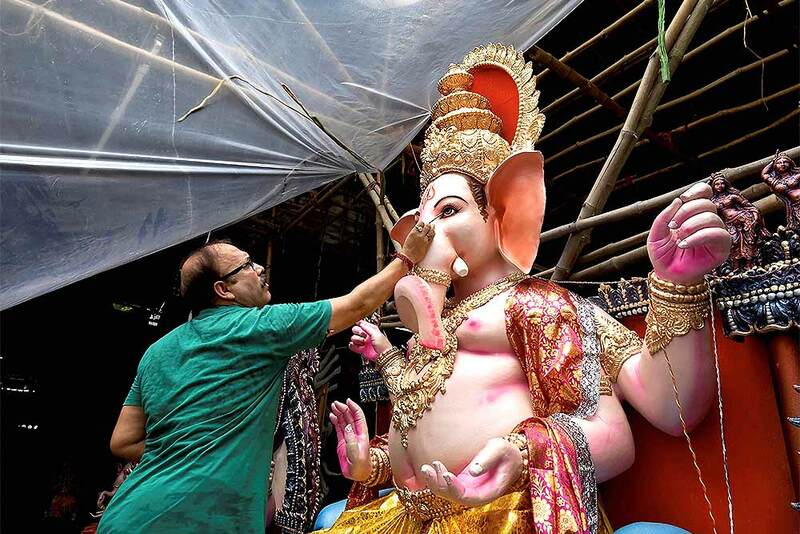 The historic priceless objects went missing from the Nizam Museum at Purani Haveli, Sunday. 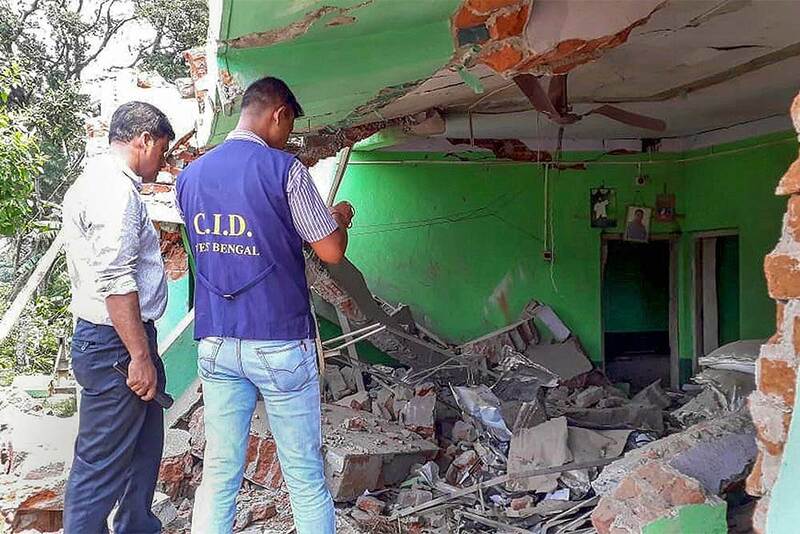 Bomb Disposal Squad personnel CID inspect the Trinamool Congress office which collapsed after the explosion of crude bombs inside it, at Barrah village in Birbhum district. 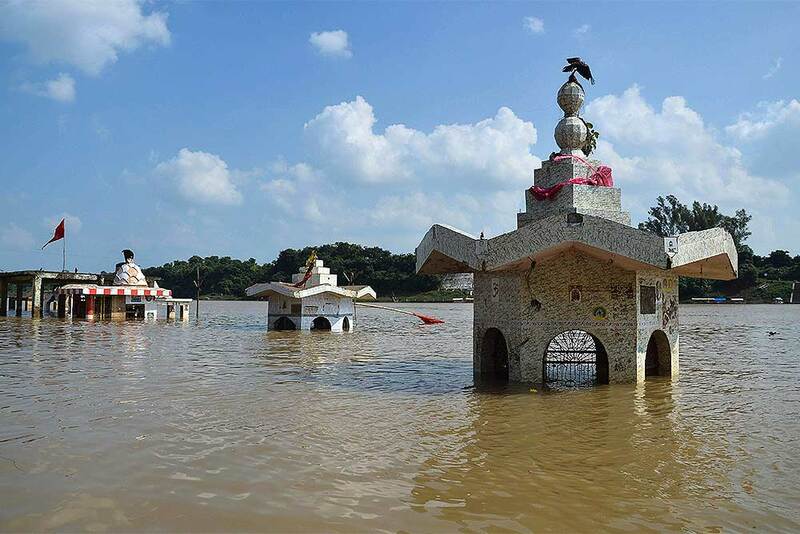 A temple stands submerged in flood waters following heavy rainfall near Gwarighat in Jabalpur. 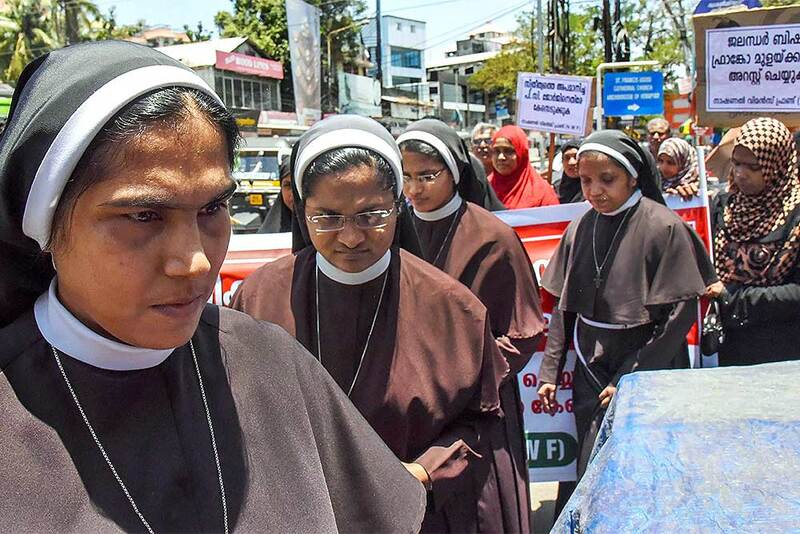 Nuns, supported by women from the Muslim community, protest against the delay in action on a Roman Catholic church bishop who is accused of sexually exploiting a nun, in Kochi. 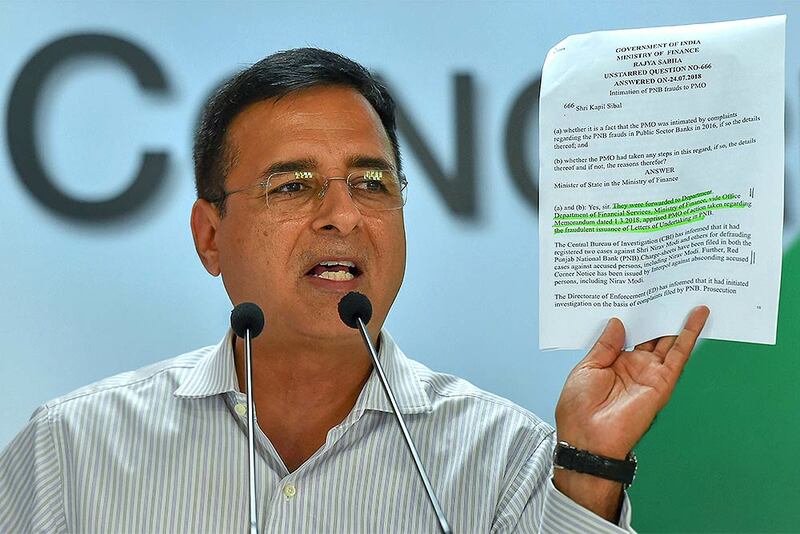 Senior Congress leader Randeep Surjewala gestures during a press conference, in New Delhi. 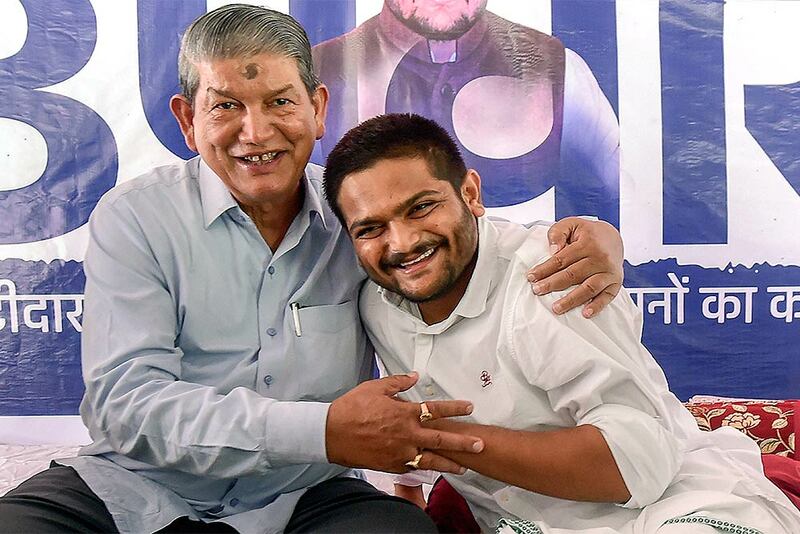 Uttarakhand's former chief minister Harish Rawat meets Patidar Anamat Andolan Samiti (PAAS) leader Hardik Patel during Patel's ongoing indefinite hunger strike for reservation since August 25, in Ahmedabad. 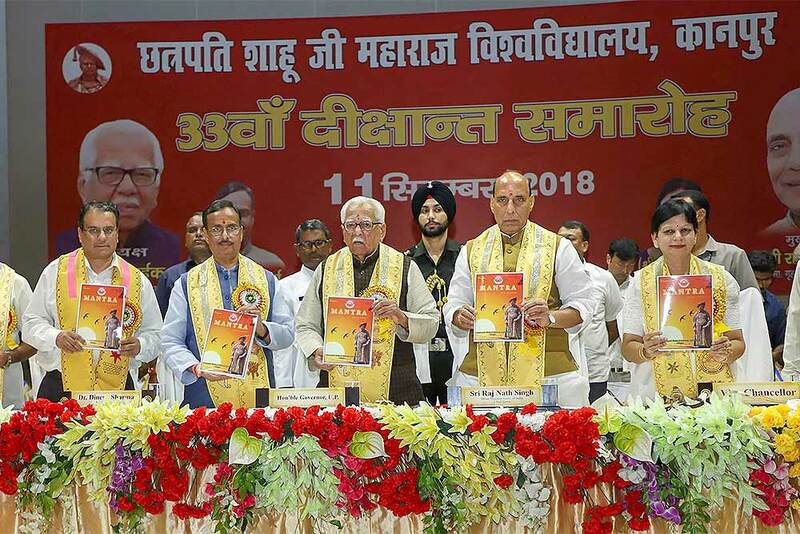 Uttar Pradesh Governor Ram Naik with Union Home Minister Rajnath Singh launch a souvenir at the 33rd convocation of Chhatrapati Shahu Ji Maharaj University, in Kanpur. 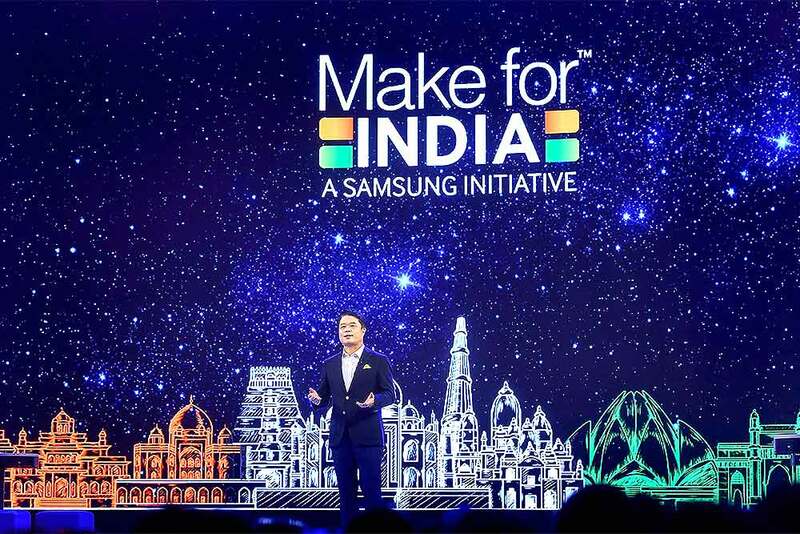 Samsung Southwest Asia President and CEO HC Hong speaks during the inauguration of world’s largest mobile experience center 'Samsung Opera House', in Bengaluru. 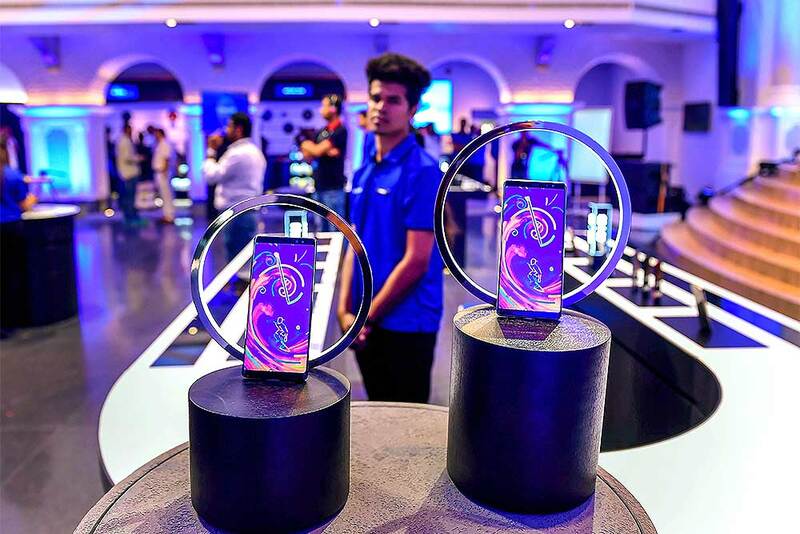 An employee looks on during the inauguration of world’s largest mobile experience center 'Samsung Opera House', in Bengaluru. 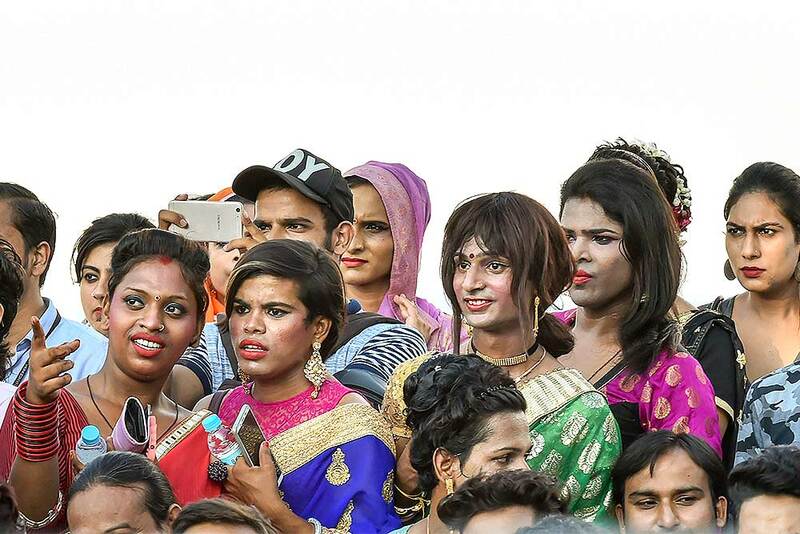 Models participating in an international beauty pageant pose for photos in front of the Taj Mahal, in Agra. 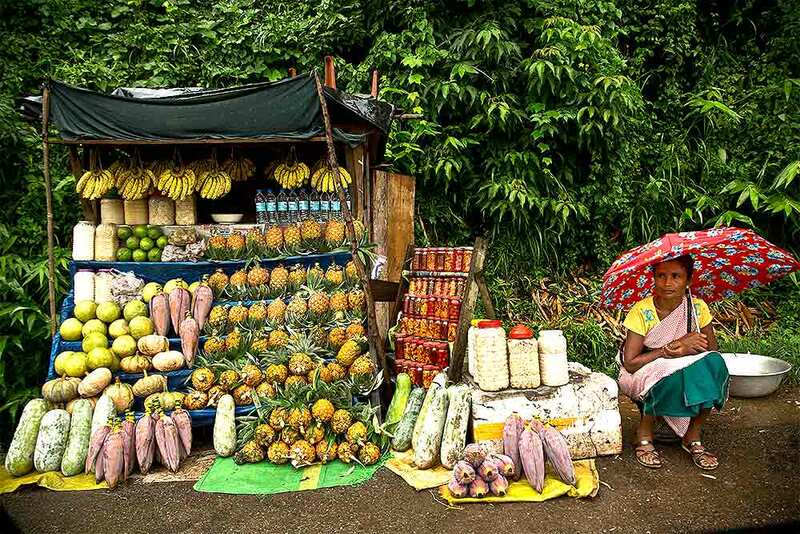 A Khasi tribal woman waits for customers in the rain on a highway along the Assam-Meghalaya state border. 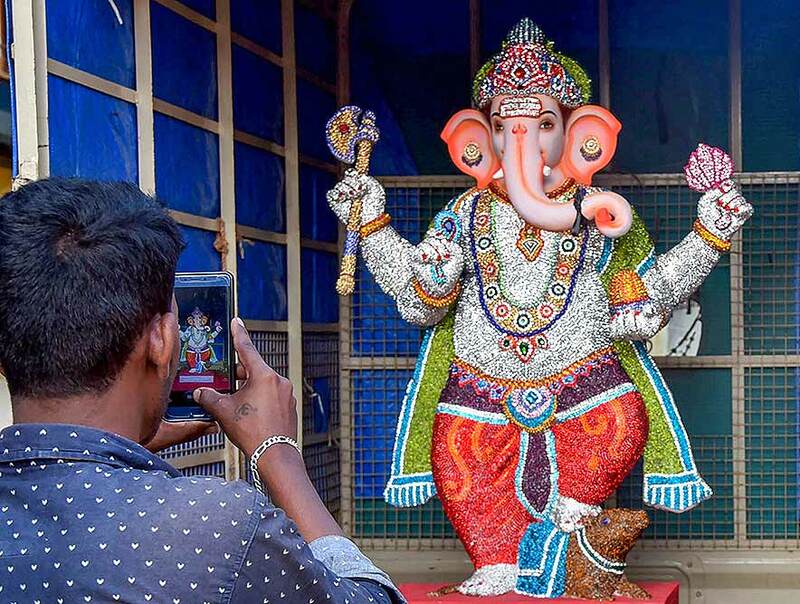 The monsoon rains which normally run from June to September, are crucial in a country where 60 percent of the population works in agriculture and less than half the farmland is irrigated. 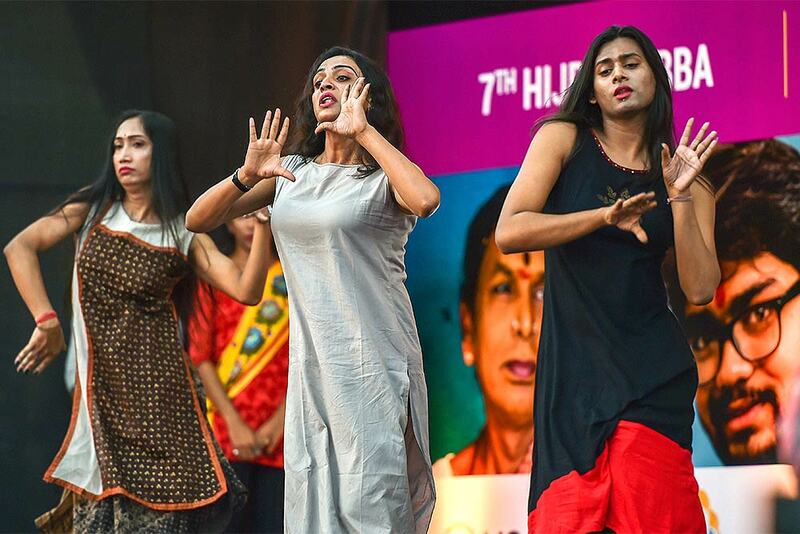 Transwomen artists during the inauguration of seventh edition of Hijra Habba, at Select Citywalk Saket in New Delhi. 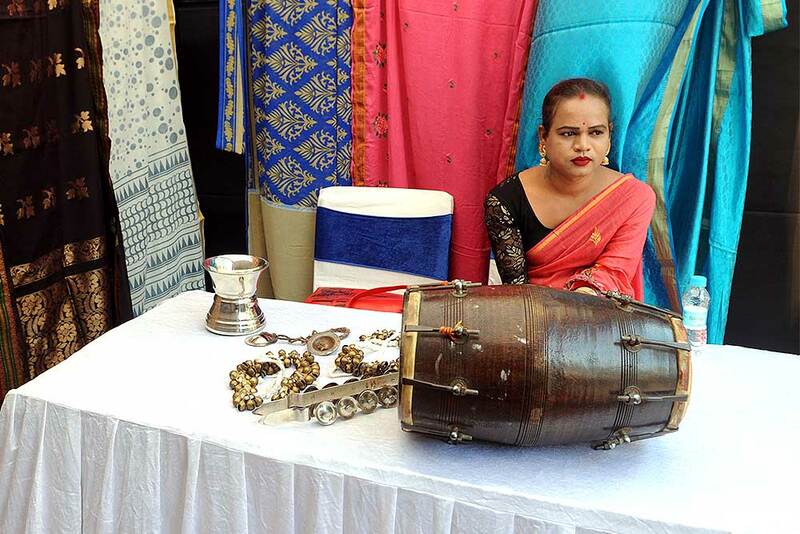 Transwomen artist during the inauguration of seventh edition of Hijra Habba, at Select Citywalk Saket in New Delhi. 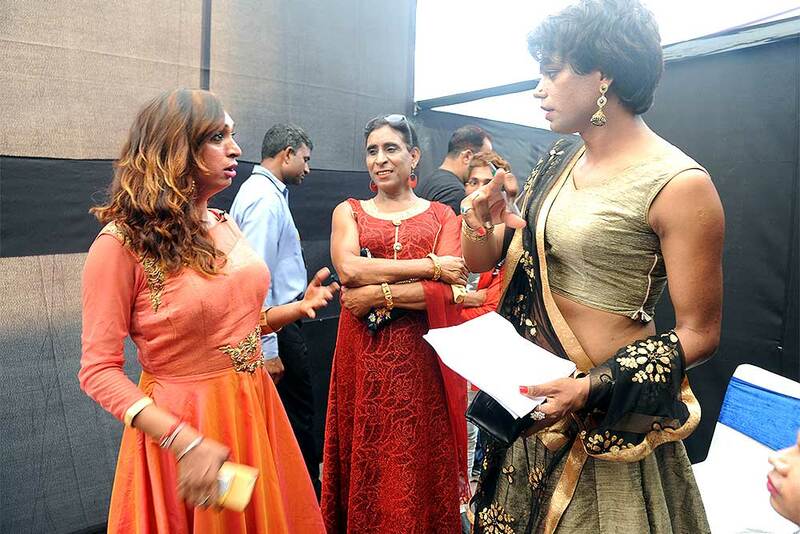 Aizya (Naaz) Joshi (R), India’s first transsexual to win Ms Diversity 2018, at the seventh edition of Hijra Habba, at Select Citywalk Saket in New Delhi. 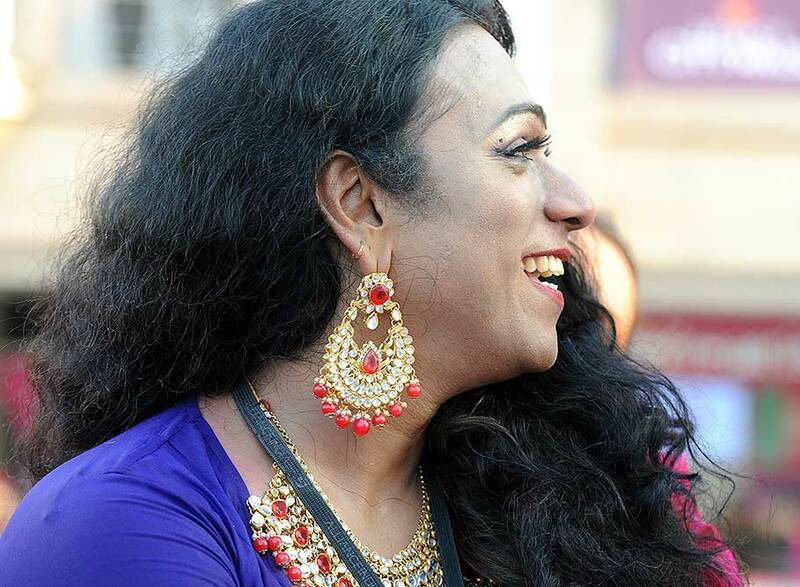 LGBT Member during the inauguration of seventh edition of Hijra Habba, at Select Citywalk Saket in New Delhi. 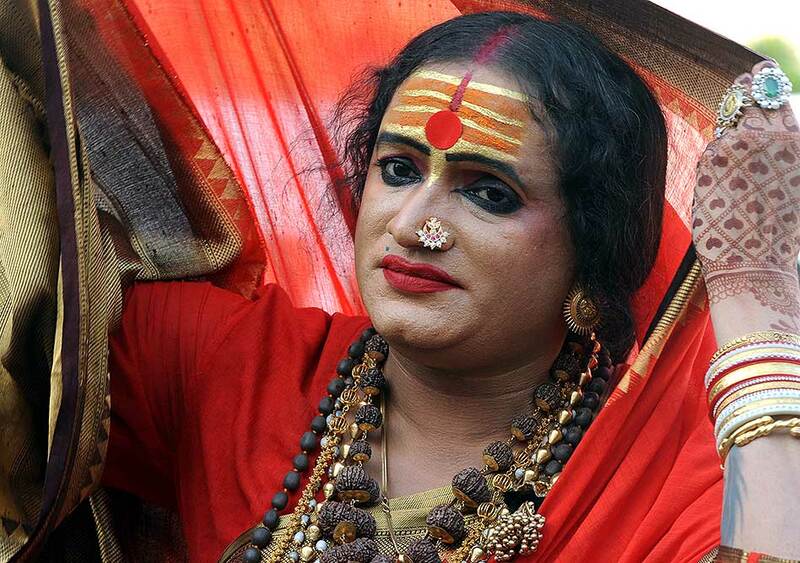 Laxmi Narayan Tripathi during the inauguration of seventh edition of Hijra Habba, at Select Citywalk Saket in New Delhi. 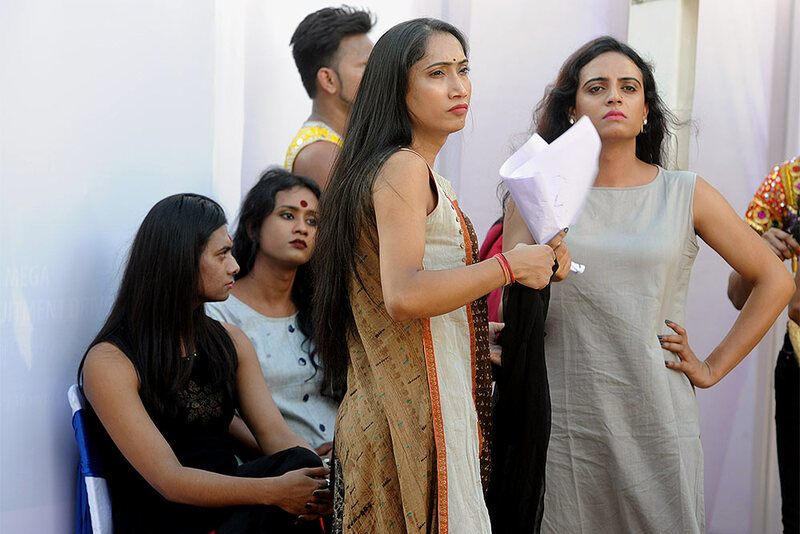 LGBT members during the inauguration of seventh edition of Hijra Habba, at Select Citywalk Saket in New Delhi. 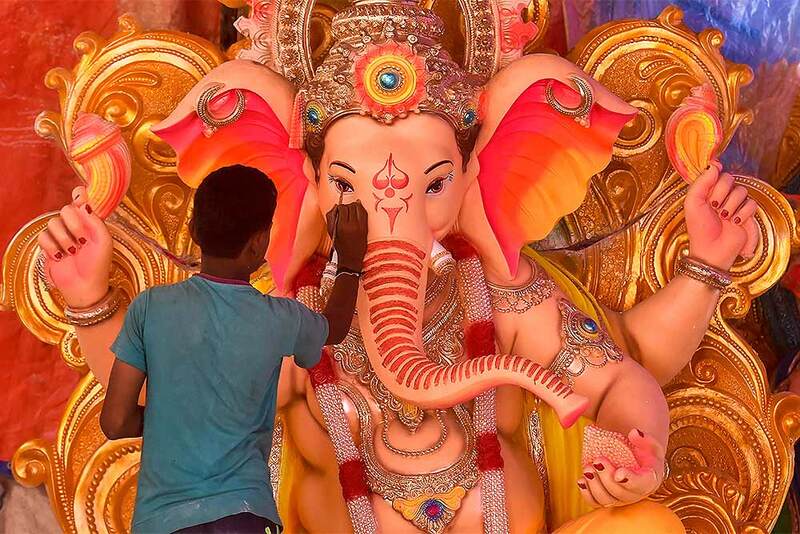 LGBT member during the seventh edition of Hijra Habba, at Select Citywalk Saket in New Delhi.